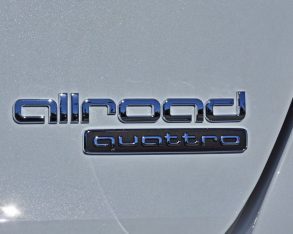 crossovers. 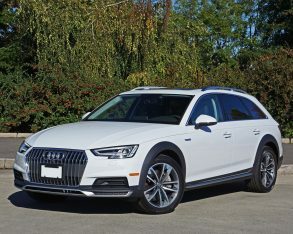 Many tall all-wheel drive wagons with matte grey body cladding and raised ride height had been and gone before Audi’s entry arrived in 1999, but all, including the ’79 AMC Eagle, ’80 Subaru GL AWD Wagon, ’84 Toyota Tercel SR5 4WD Wagon, ’85 Honda Civic 4WD Wagon, ’86 Nissan Sentra 4WD Wagon, ’89 Toyota Corolla “All-Trac” SR5 4×4 Wagon, and ’94 Subaru Outback (fill me in on what I missed) were sold into mainstream volume market segments, whereas the four-ringed Ingolstadt brand’s modified A6 Avant wagon was one of the first of such CUVs targeting premium buyers. 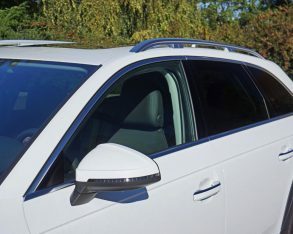 Volvo’s V70 XC Cross Country beat it to market by two years, and the two beefed up wagons have enjoyed little competition since. 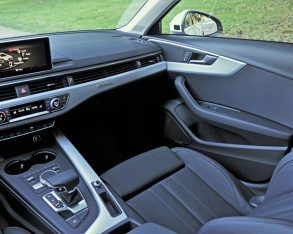 the A4 Avant’s compact D-segment in 2012 as a 2013 model. 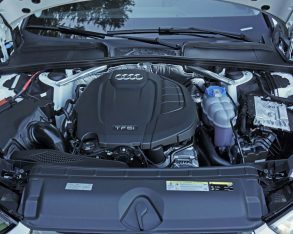 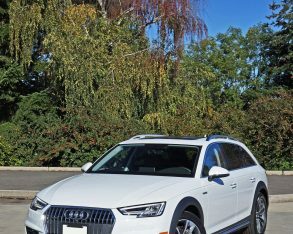 We covered it then and again last year, and were impressed in both instances, but nevertheless that car now seems old and dated compared to this totally redesigned 2017 A4 Allroad. 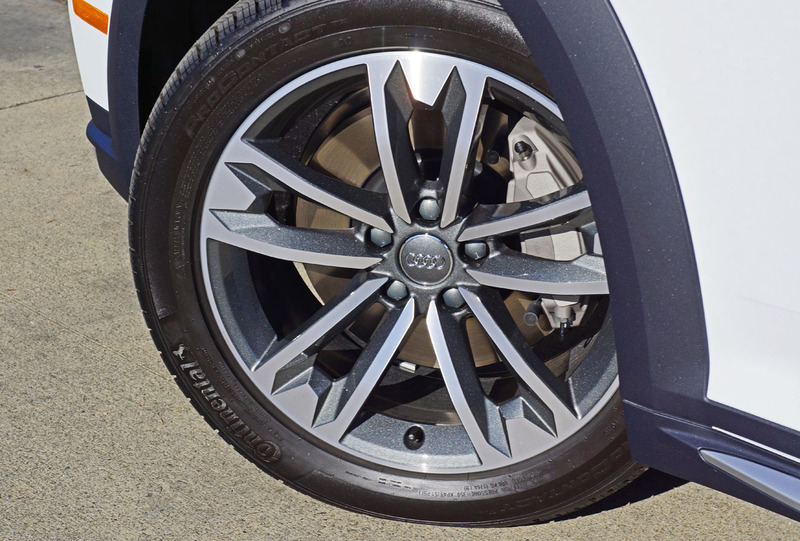 it with 19-inch alloys via the Sport package and no one would be the wiser. 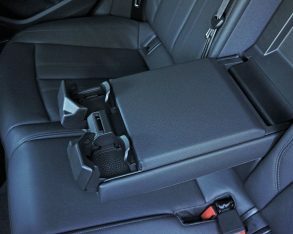 Then again, like any worthy attribute it’s what’s inside that counts. 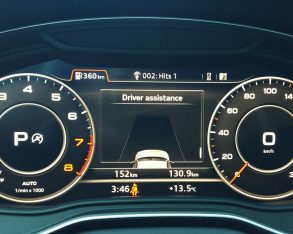 legible. 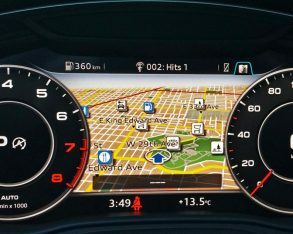 That’s only half the story, mind you, the other half requiring you to press the steering wheel-mounted “VIEW” button that dramatically downsizes the tach and speedo while upsizing the MID to the point that it takes over most of the space allotted, its colourful navigation mapping being the most dazzling function. 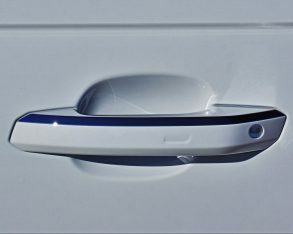 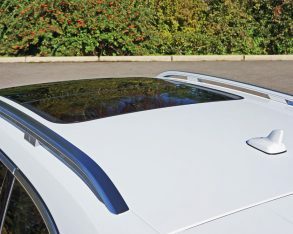 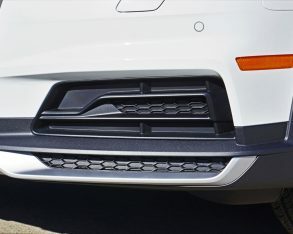 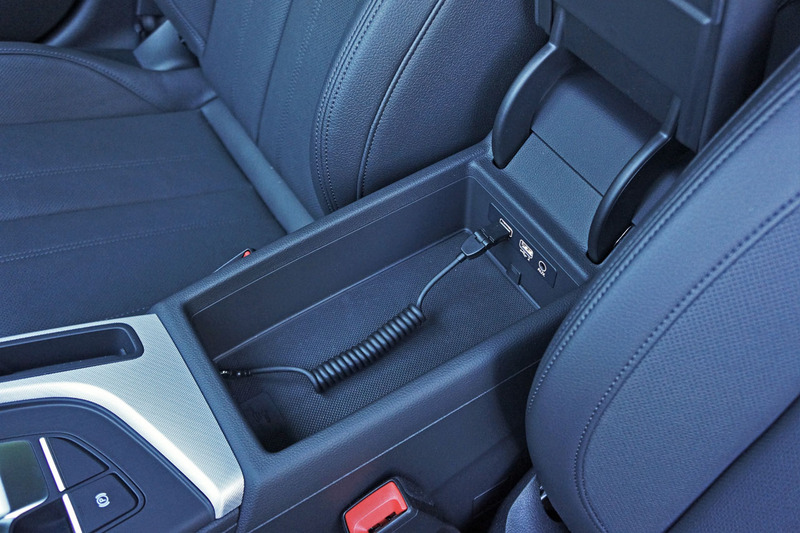 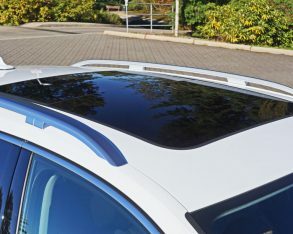 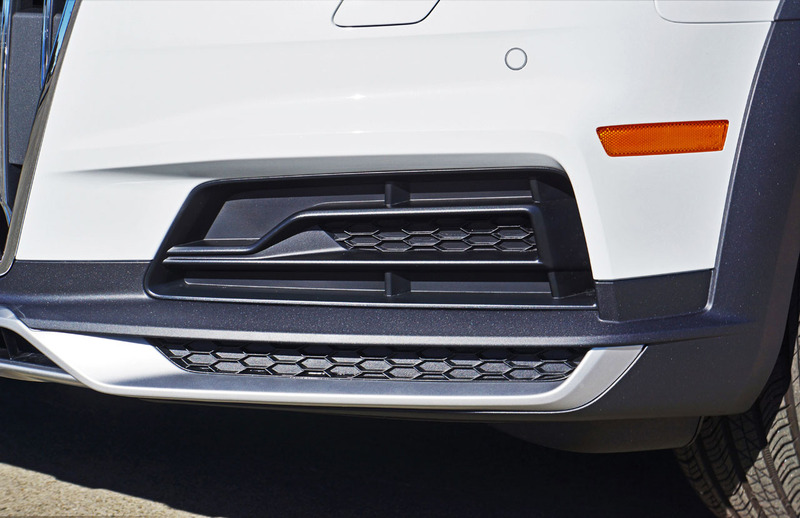 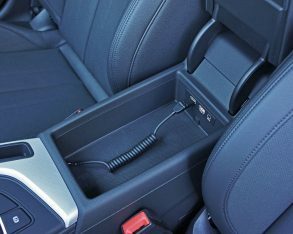 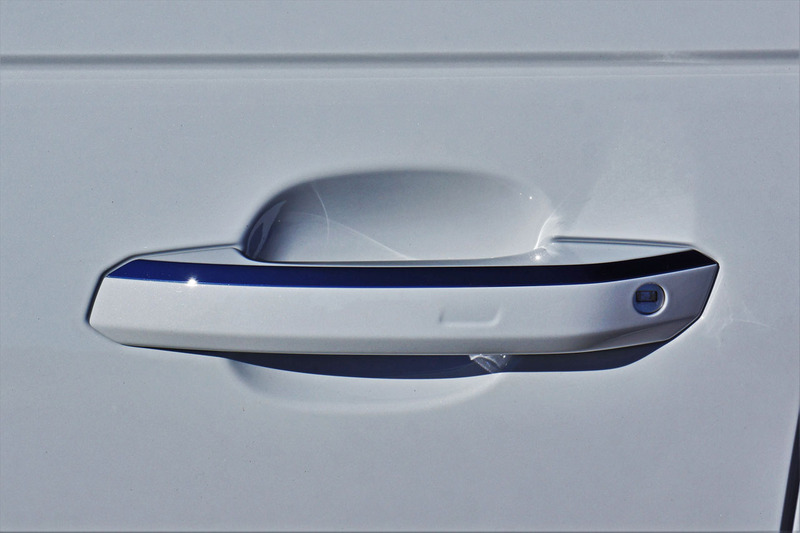 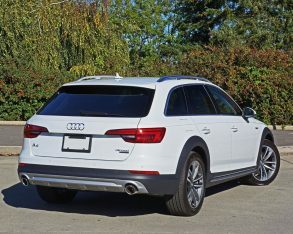 These items get added on top of the Progressiv model’s long list of features that include keyless proximity entry with a foot-activated liftgate release, power-folding side mirrors, a heatable steering wheel, an upgraded 8.3-inch MMI infotainment display with navigation and a rearview camera with active guidelines, front and rear parking sensors, auto-dimming side mirrors to go with the standard auto-dimming interior mirror, memory for those side mirrors and the driver’s seat, a Homelink garage door opener, and beautiful Aluminum Elipse inlays. 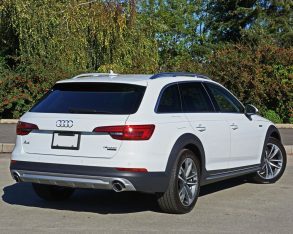 this were my very own A4 Allroad I’d also opt for the $2,000 Advanced Driver Assistance package that adds adaptive cruise control with stop and go (a must-have on road trips), traffic congestion assist, active lane assist, Audi pre sense city, Audi pre sense front, and traffic sign recognition, which is most of what’s needed for full autonomous driving and therefore capable of avoiding a crash even when we’re not at our sharpest; and it would also be difficult to pass up the very reasonable $1,400 Sport package due to its 19-inch 10-Y-spoke alloys alone, although the front sport seats with passenger-side powered lumbar, black headliner, and unique Aluminum Trimaran inlays are a bonus too. 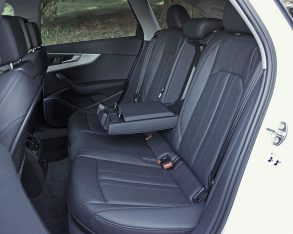 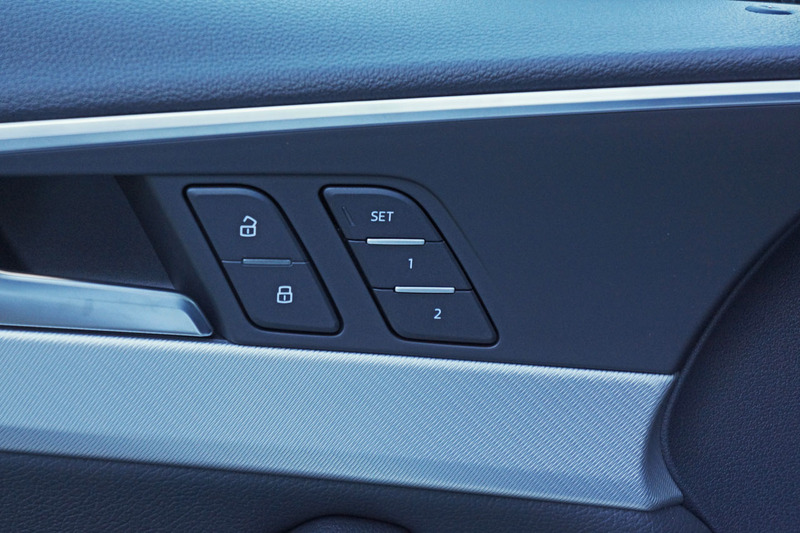 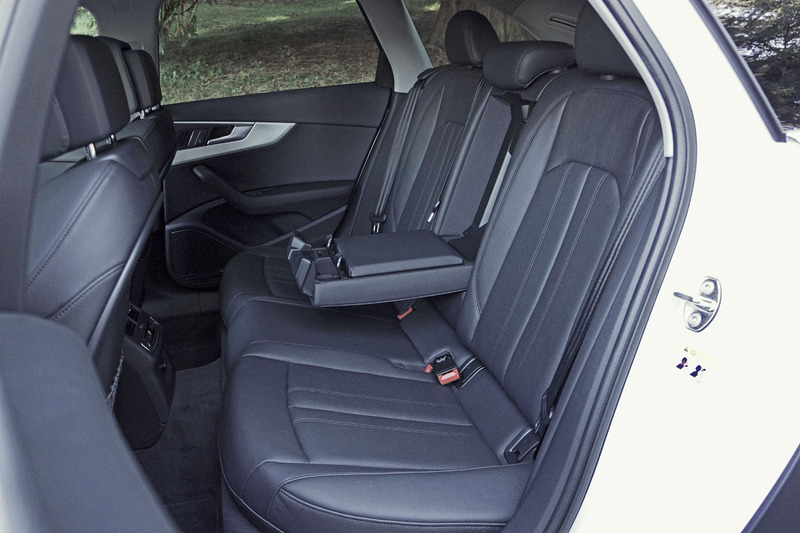 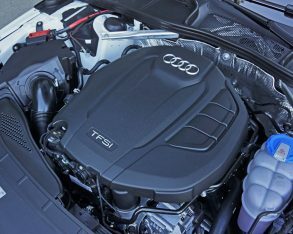 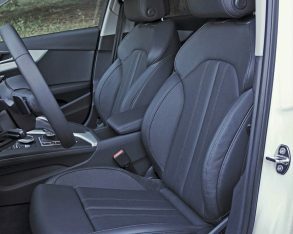 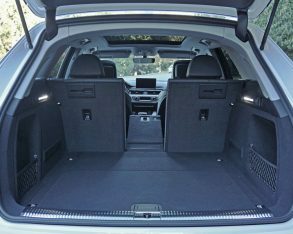 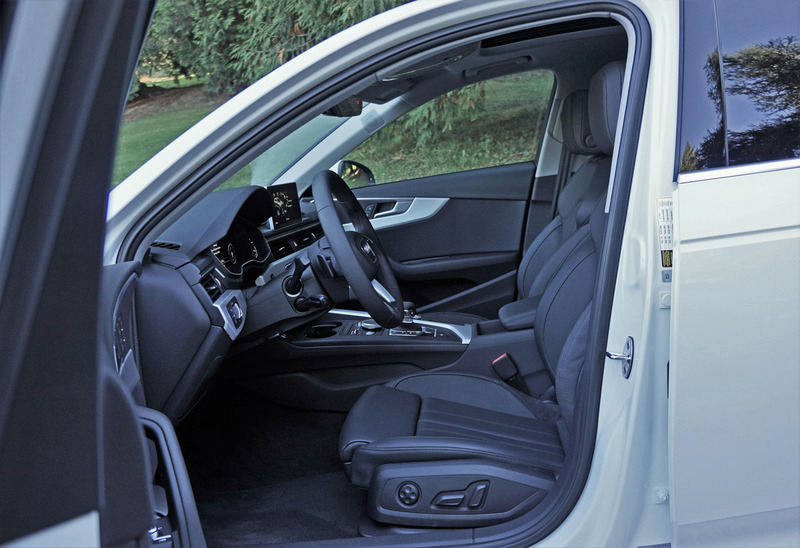 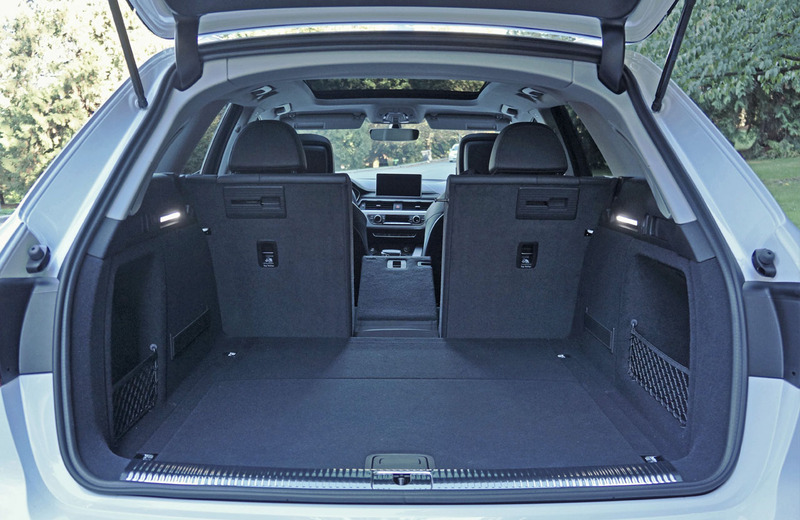 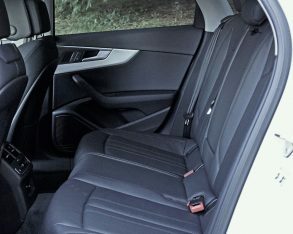 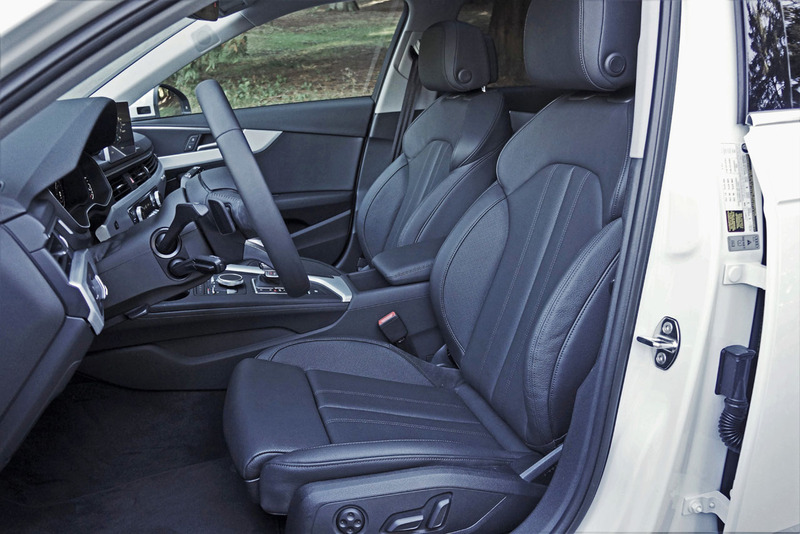 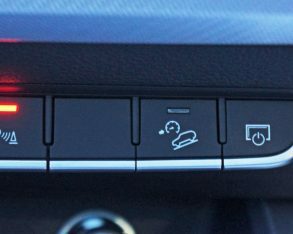 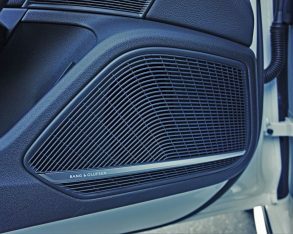 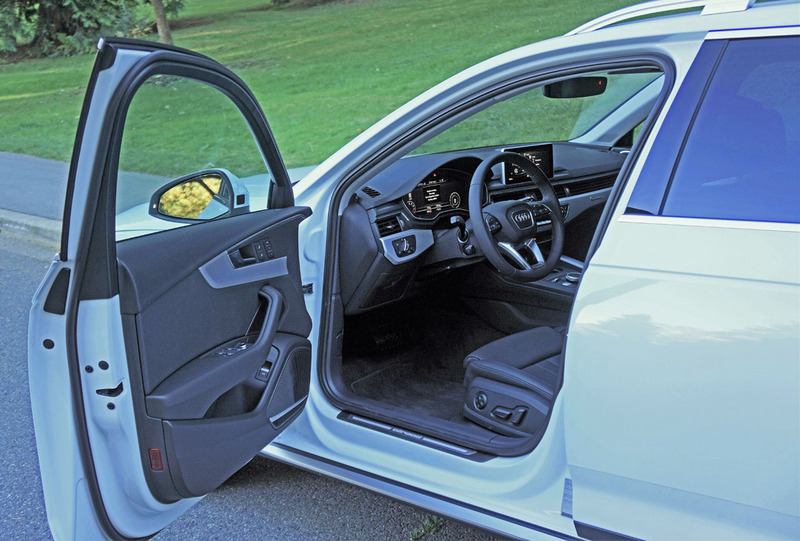 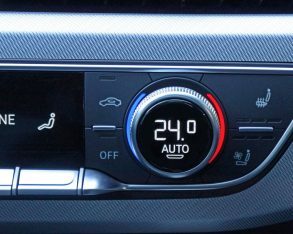 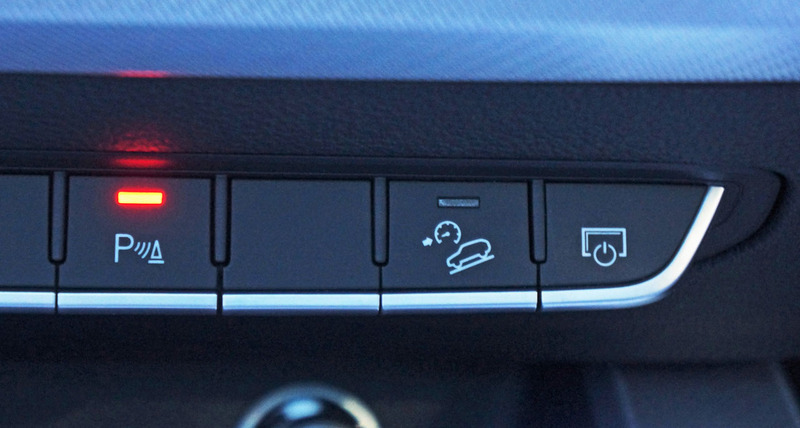 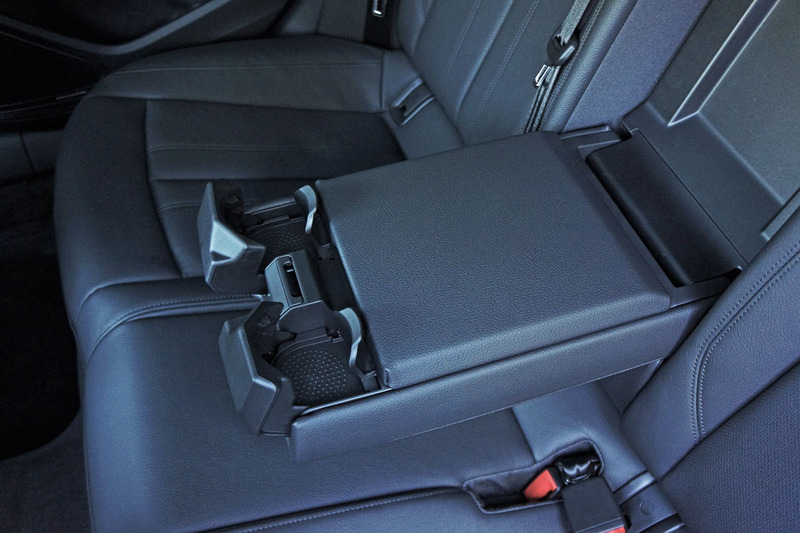 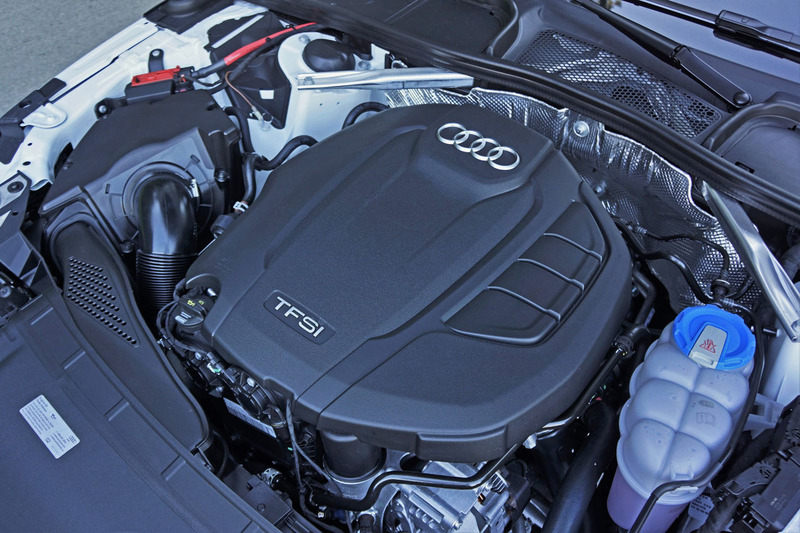 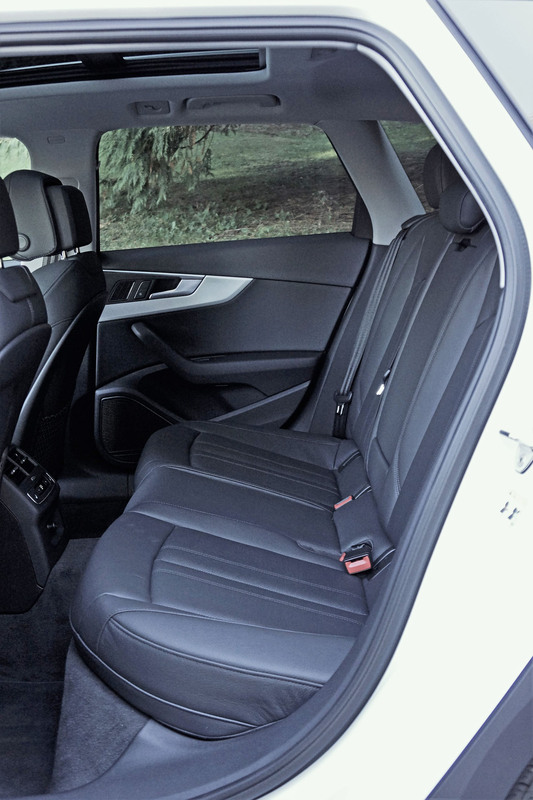 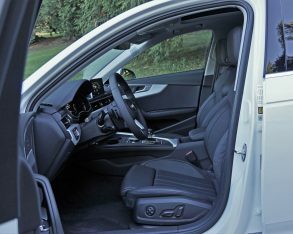 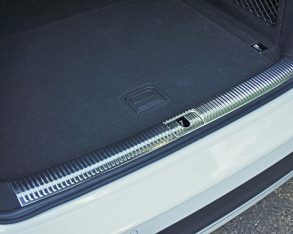 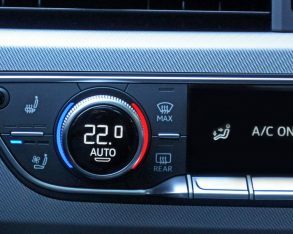 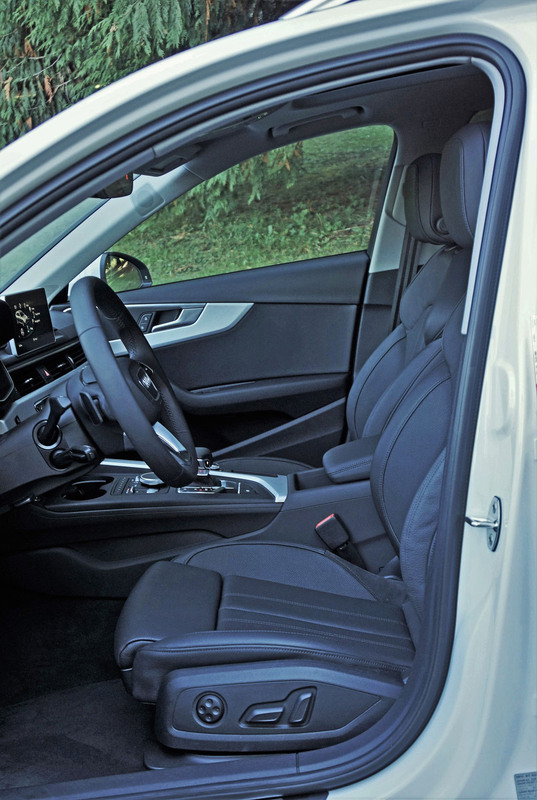 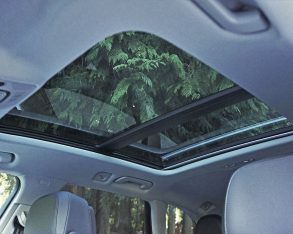 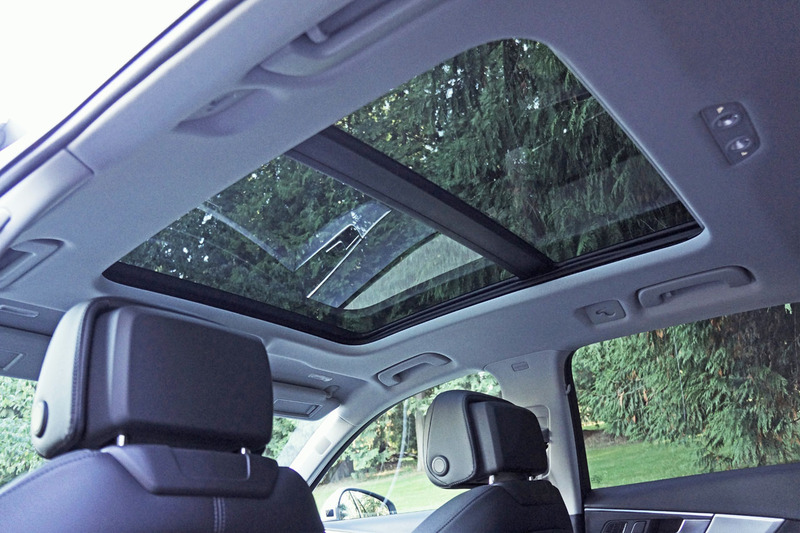 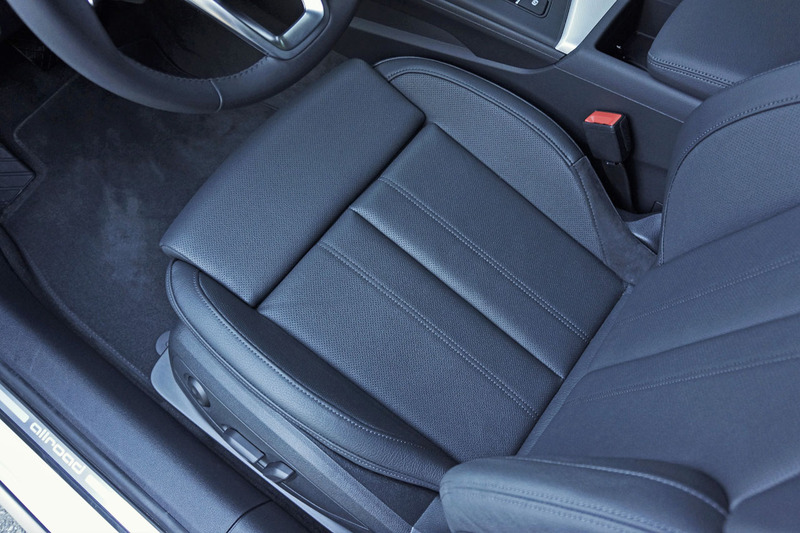 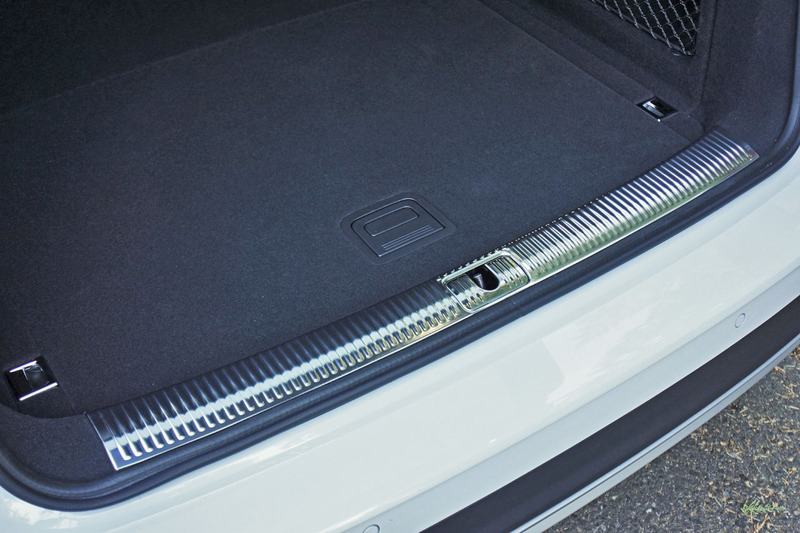 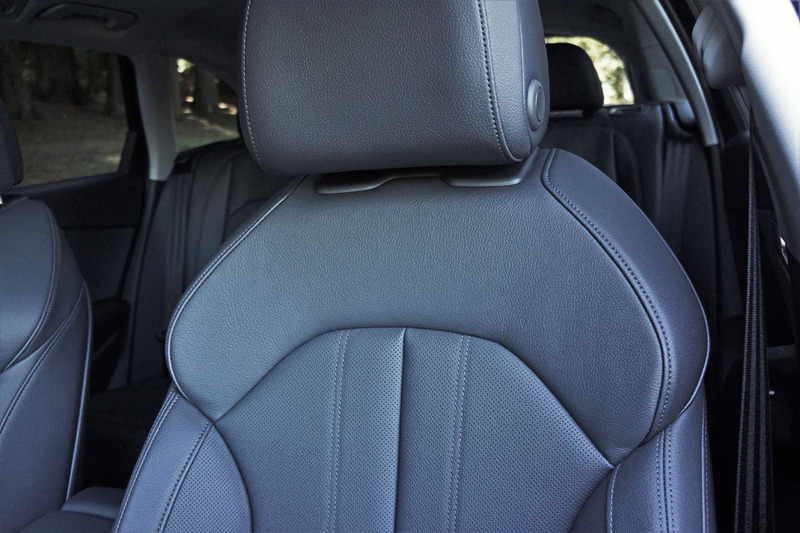 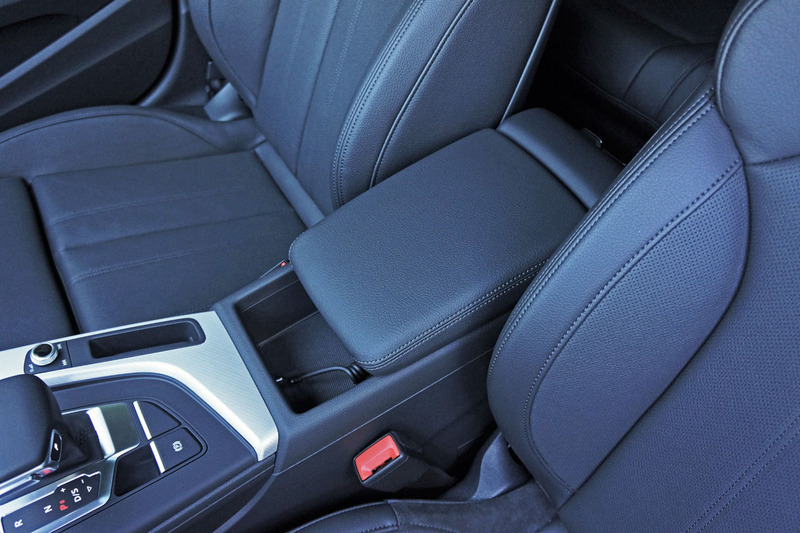 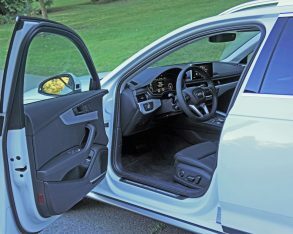 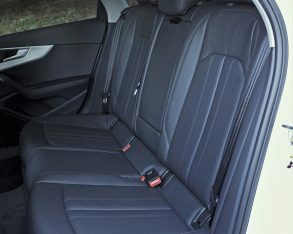 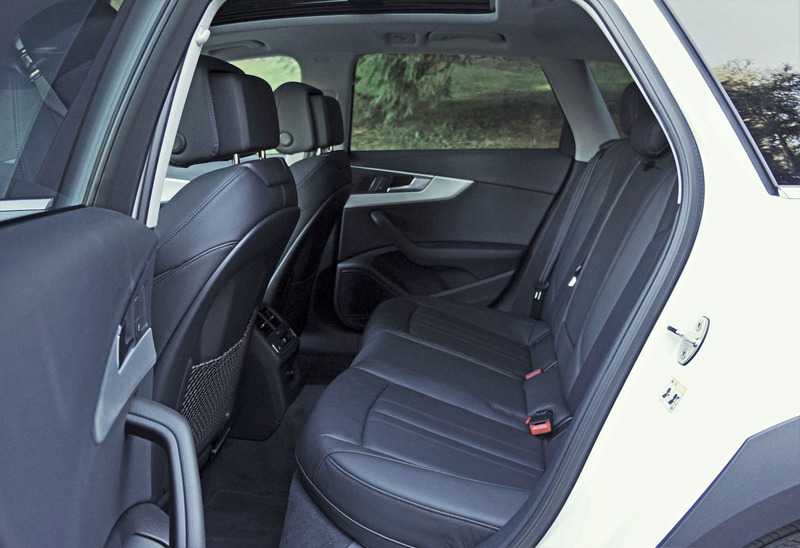 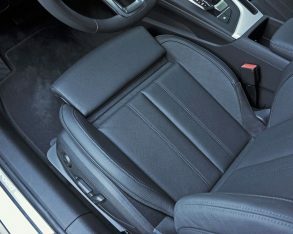 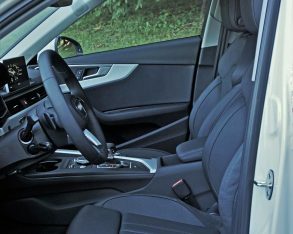 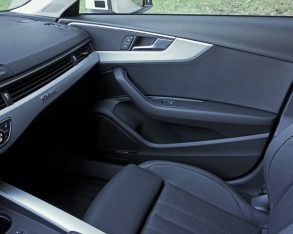 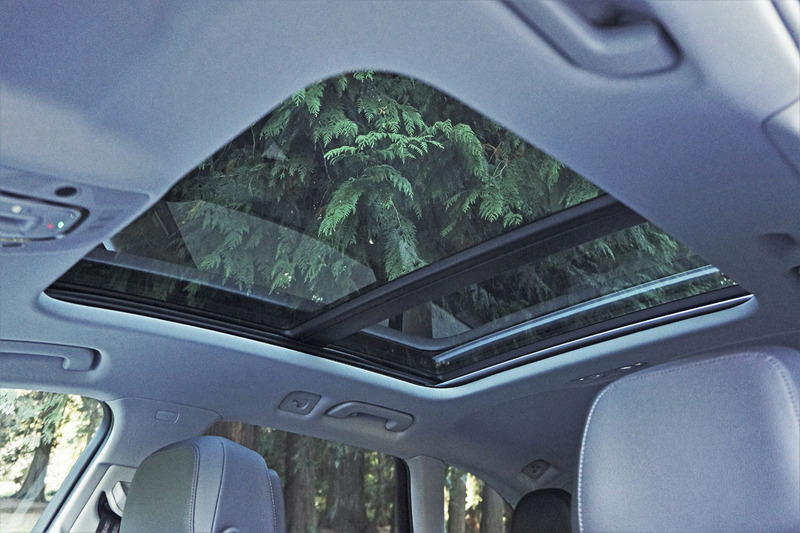 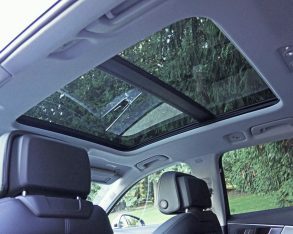 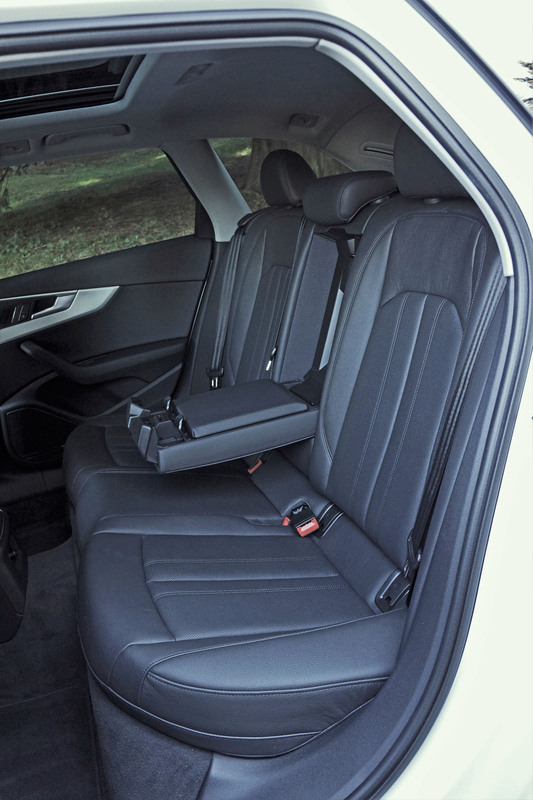 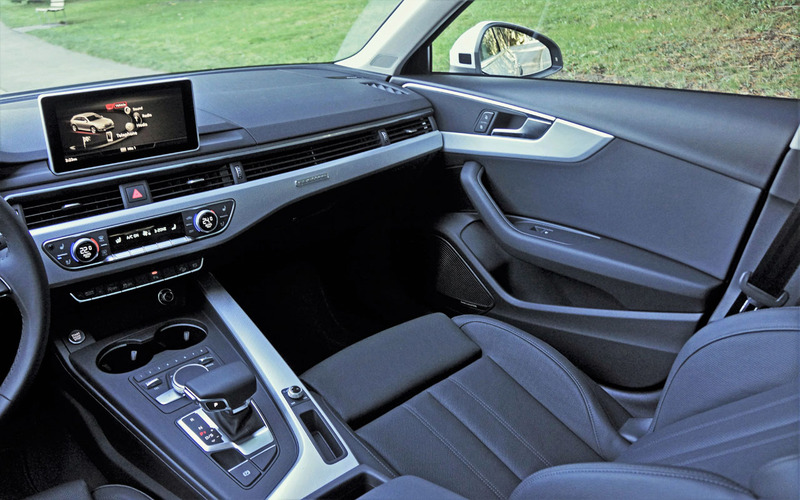 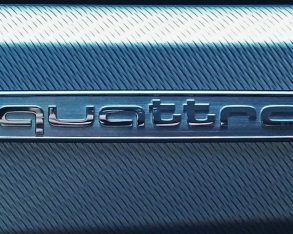 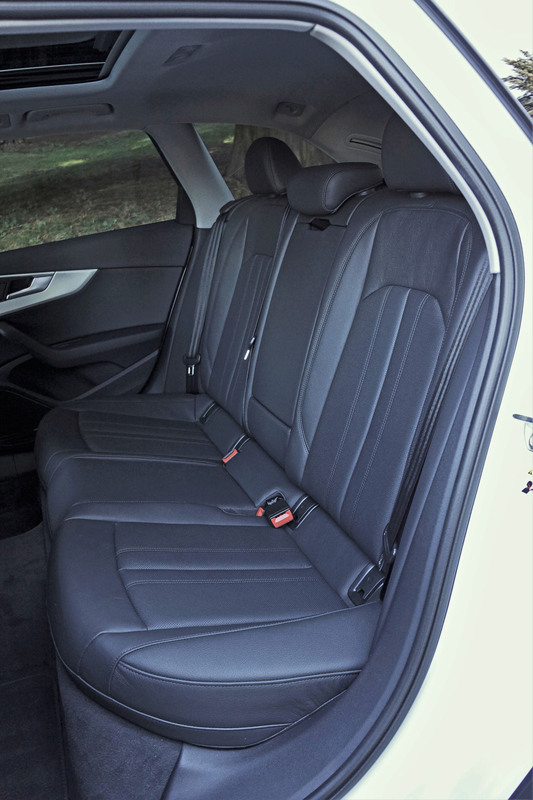 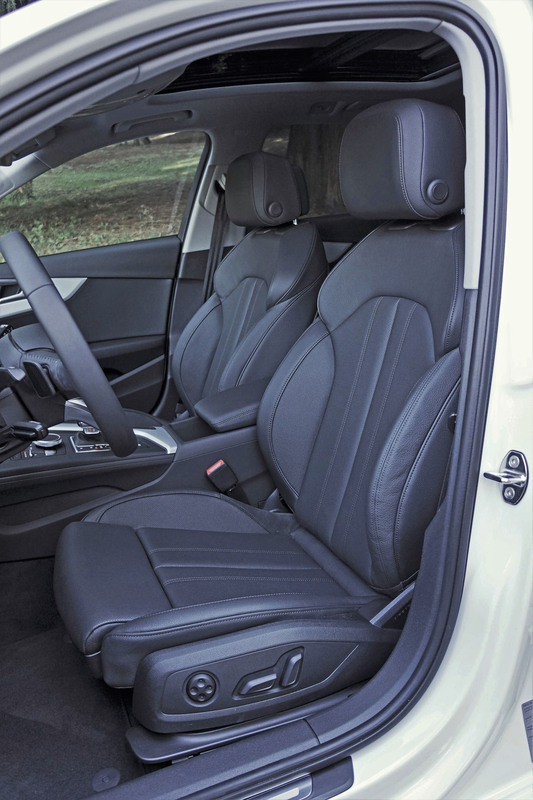 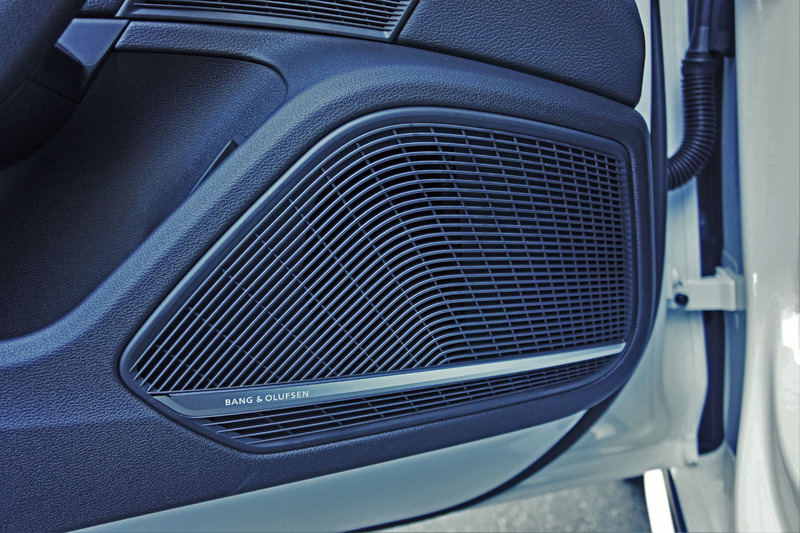 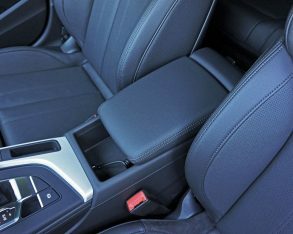 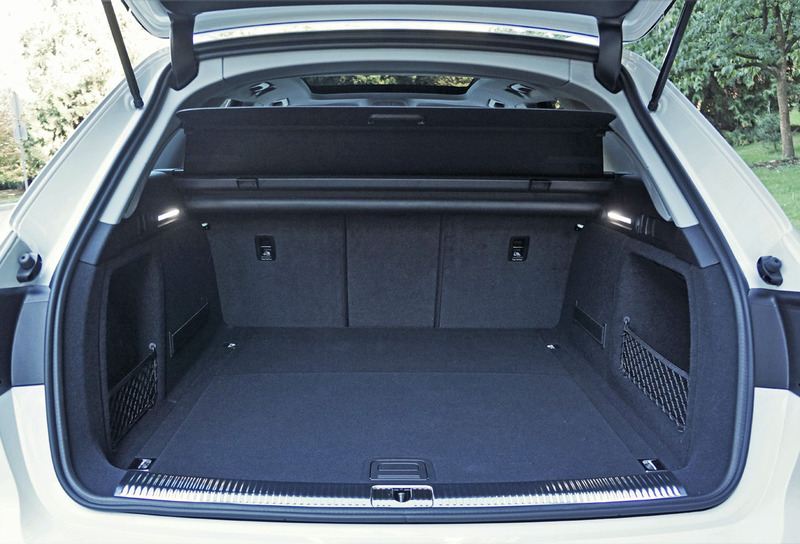 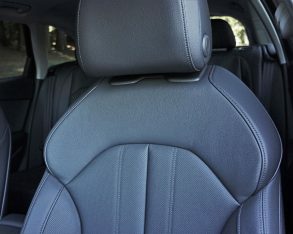 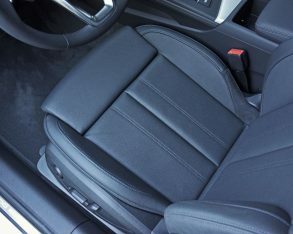 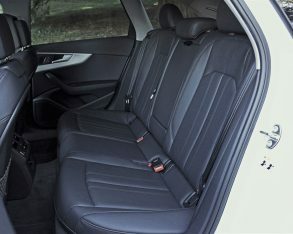 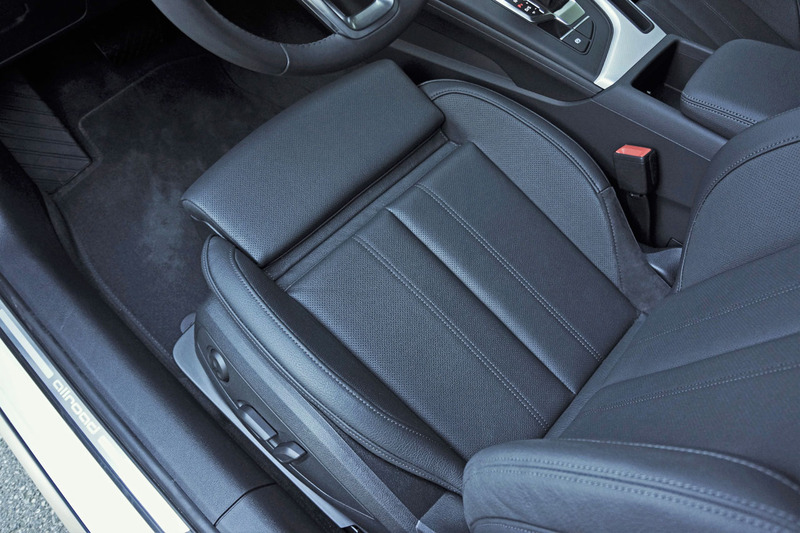 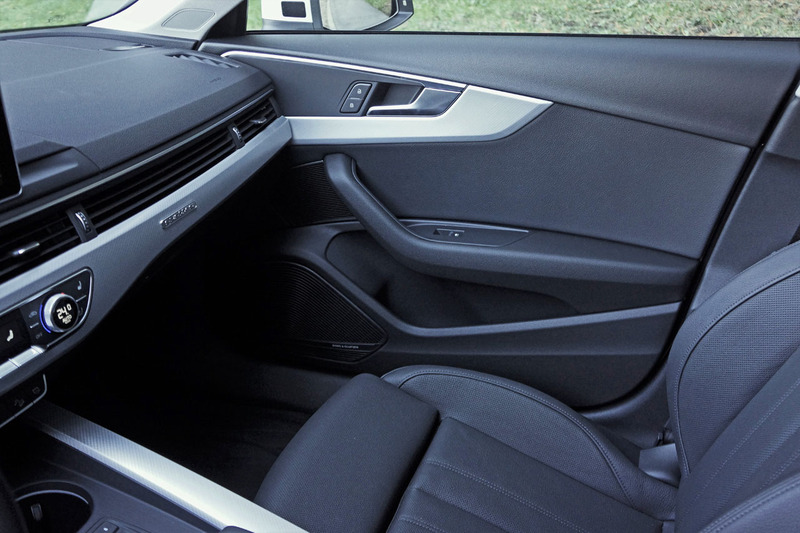 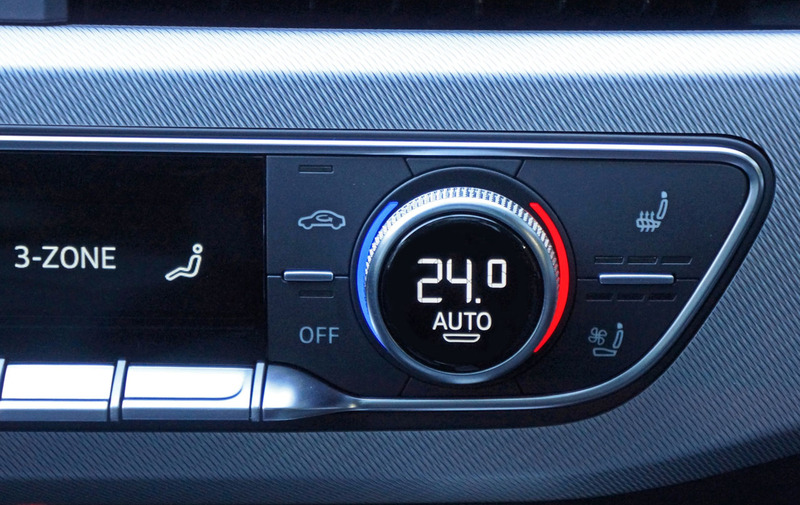 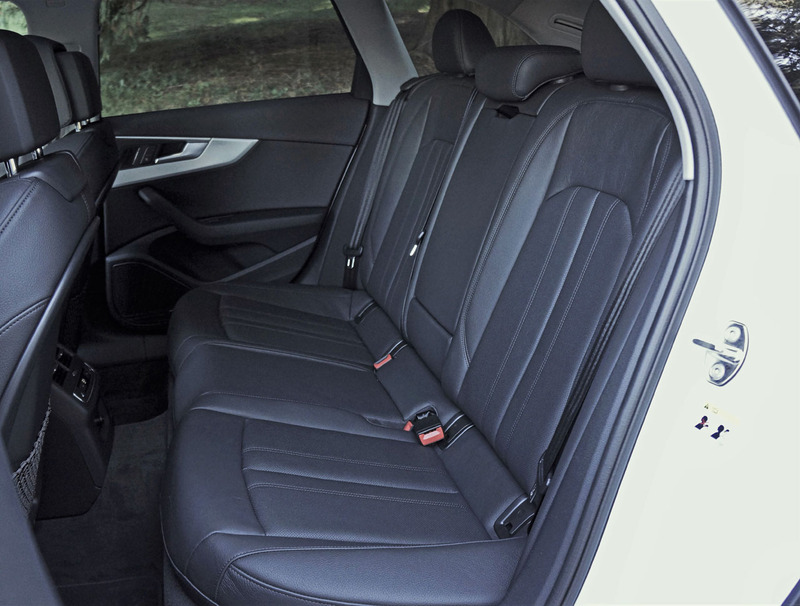 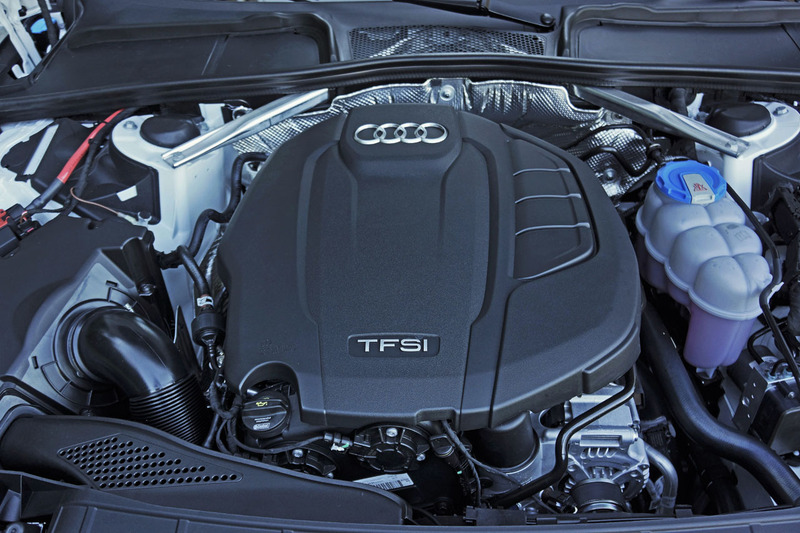 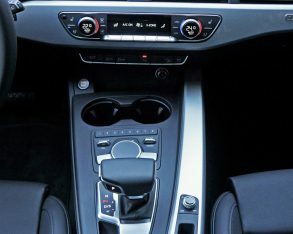 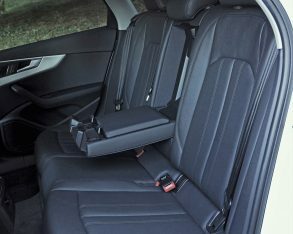 Audi also offers a $1,350 Comfort Seating package with the same upgraded sport seats albeit cooled with forced ventilation that would be ideal during those hot and sometimes humid summer days. 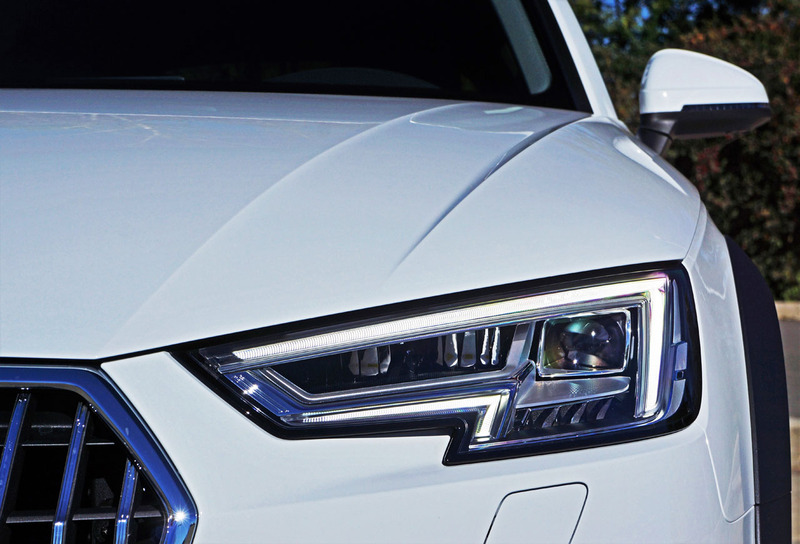 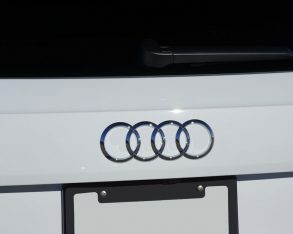 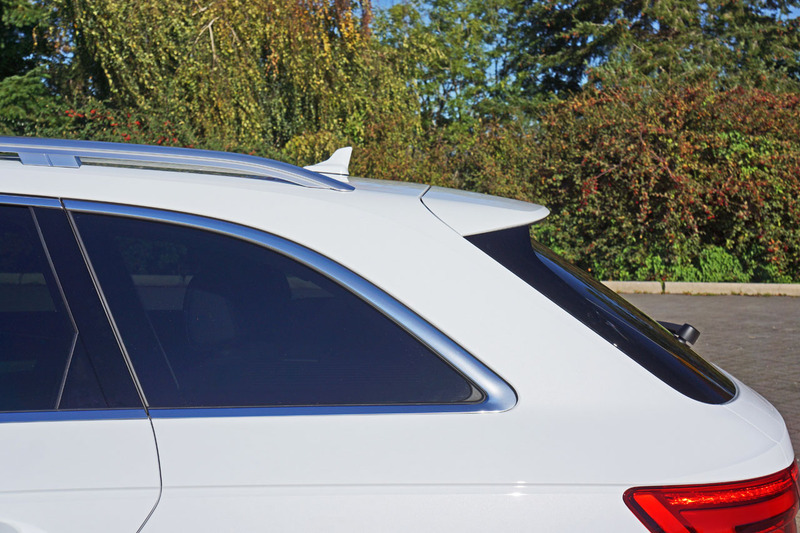 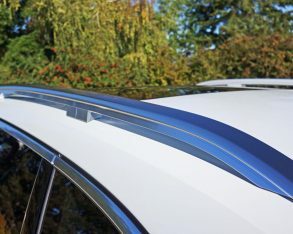 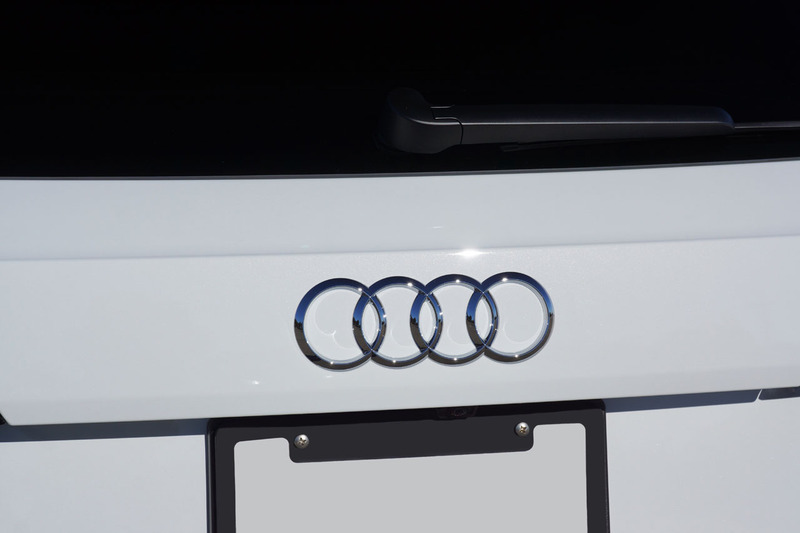 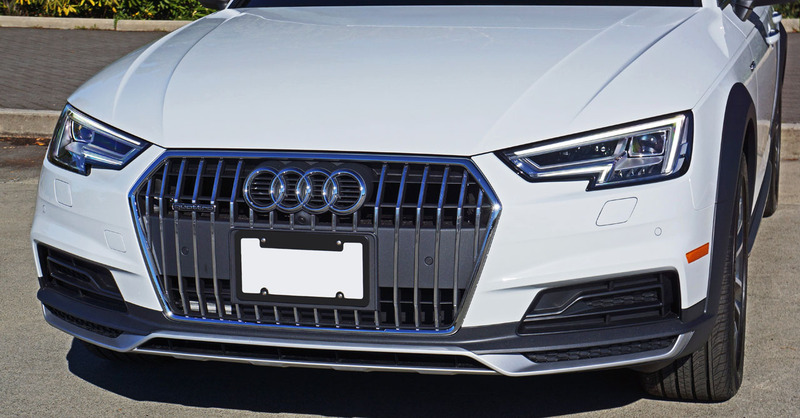 only standard colours are black and white, although Audi only charges $890 to upgrade to one of 10 metallics, my tester stunning in Glacier White, and you should also be made aware that all the matte grey body cladding can be painted body-colour for a mere $1,300. 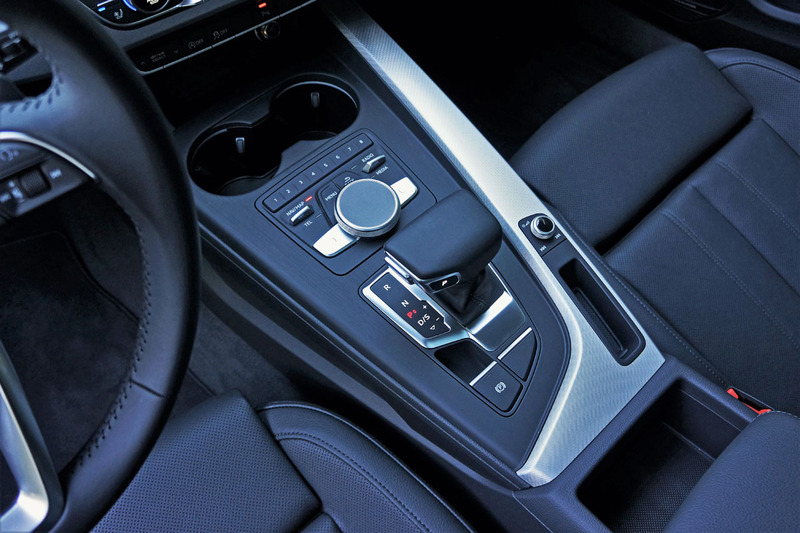 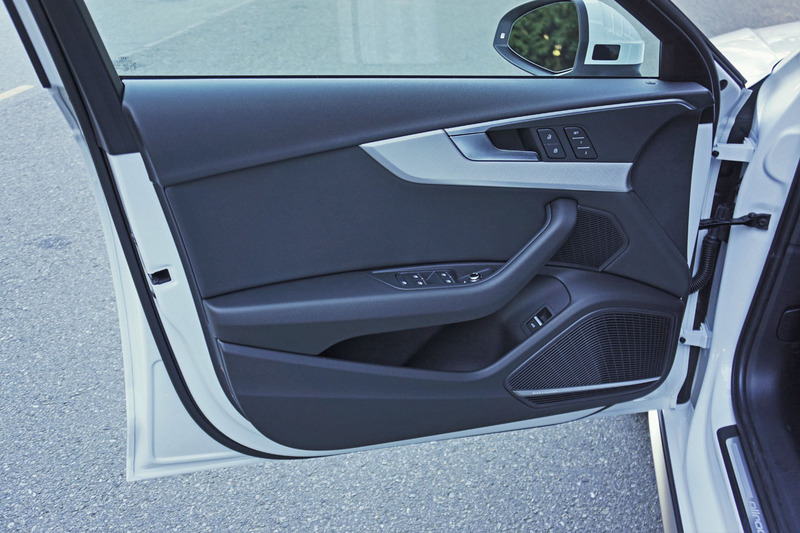 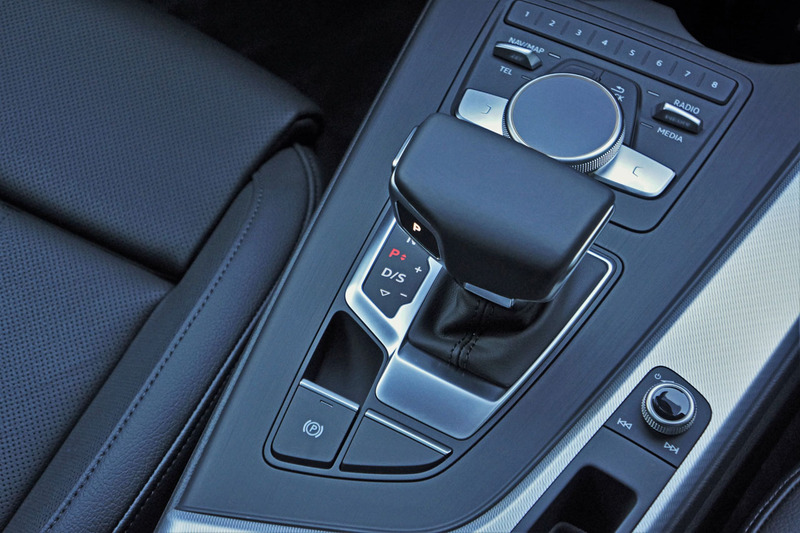 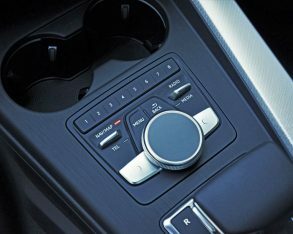 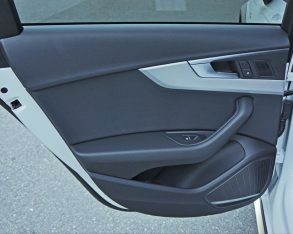 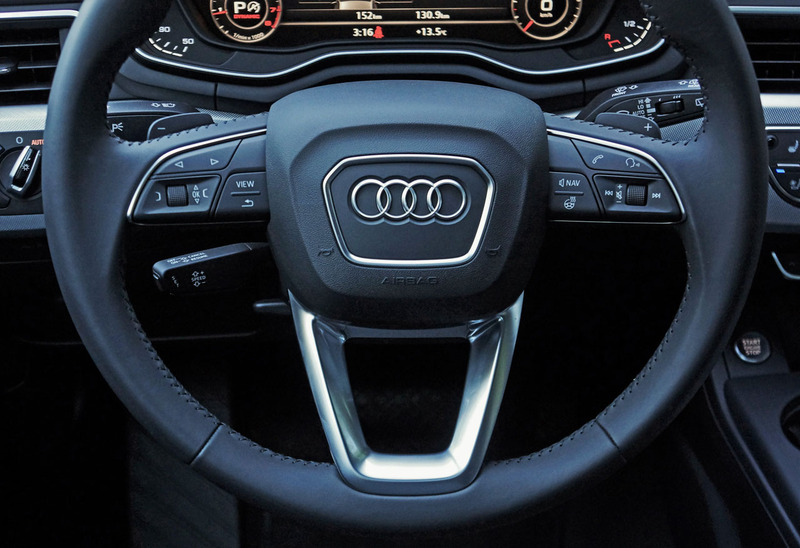 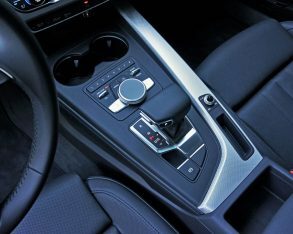 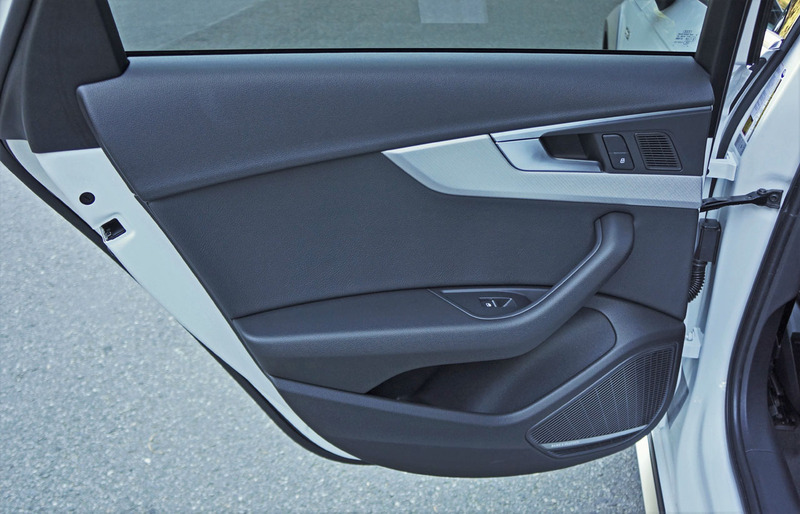 What’s more, Audi offers four interior colour themes including black, beige, brown and grey at no charge (albeit some are exterior colour dependent), while you can trade out the aluminum inlays for Natural Grey Oak or dark brown Walnut at $500 apiece. 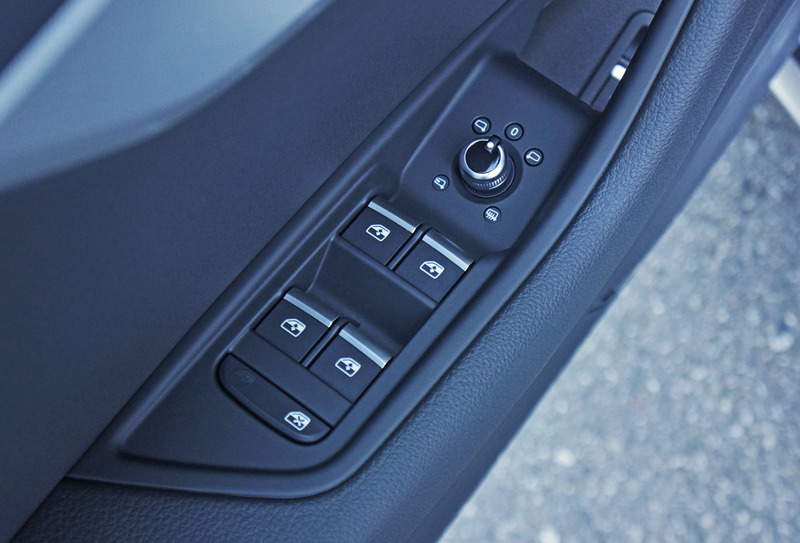 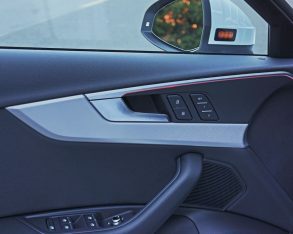 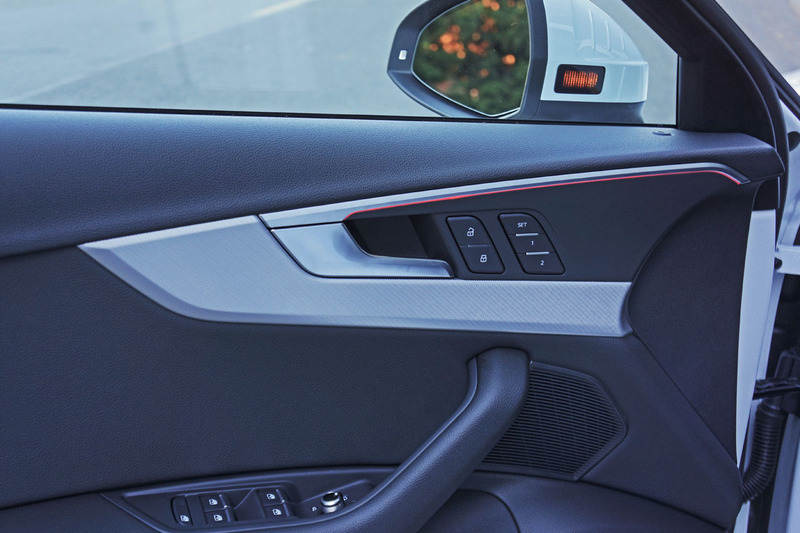 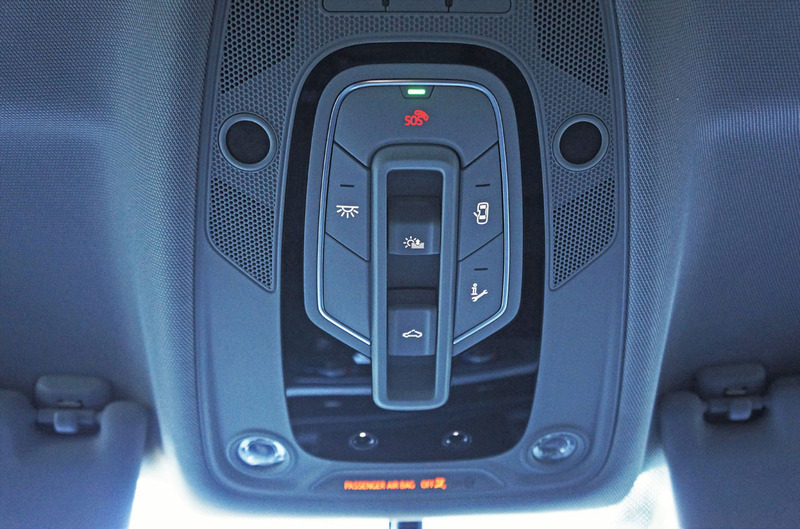 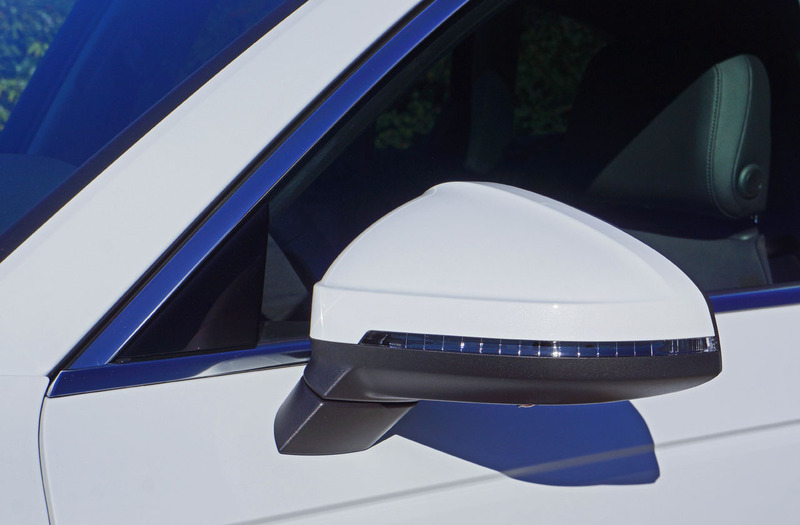 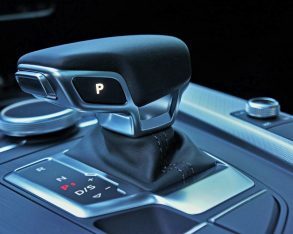 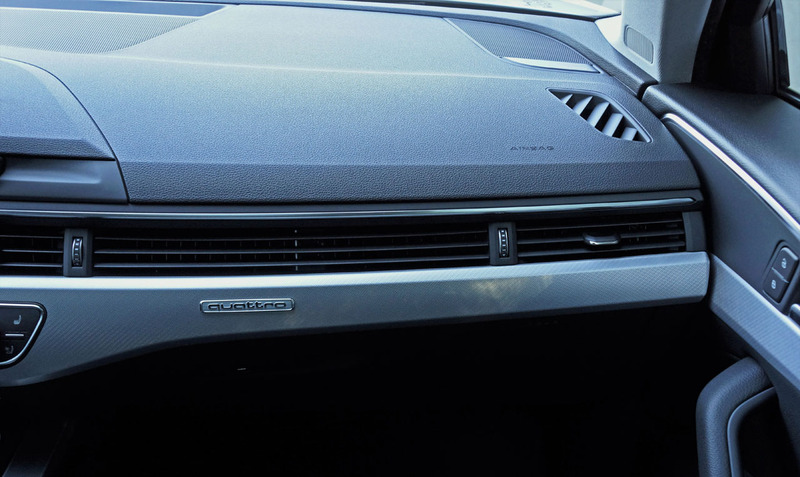 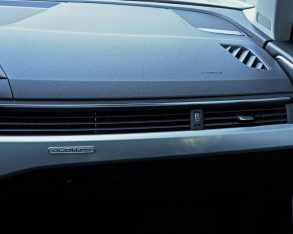 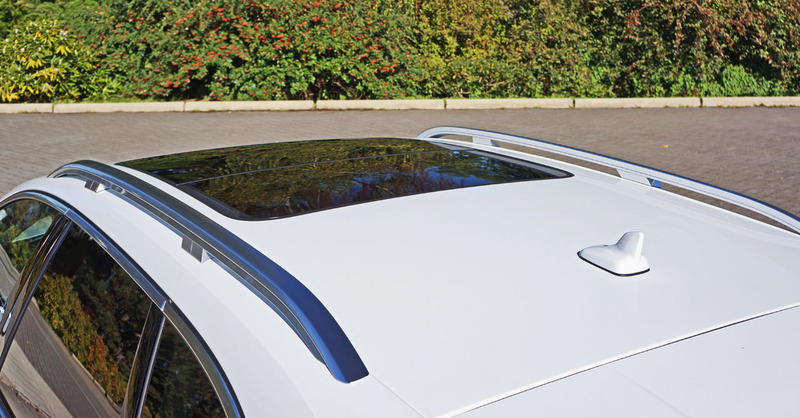 Lastly, the Technik model’s standalone features list includes an adaptive damping suspension for $1,000, a head-up display for $1,000, Audi connect assistance and security services for $520, rear side window sunshades for $300, and rear outboard side-thorax airbags for $500. 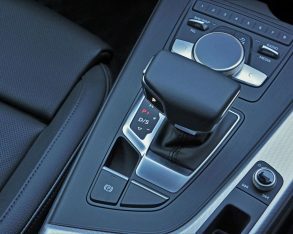 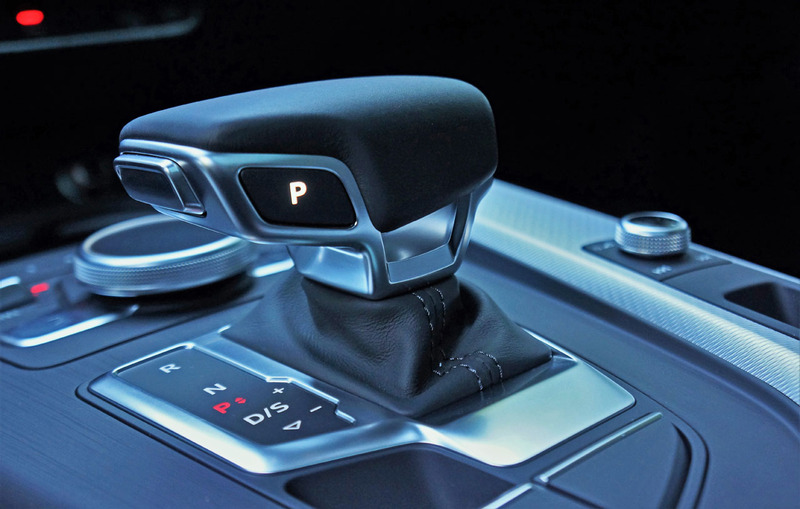 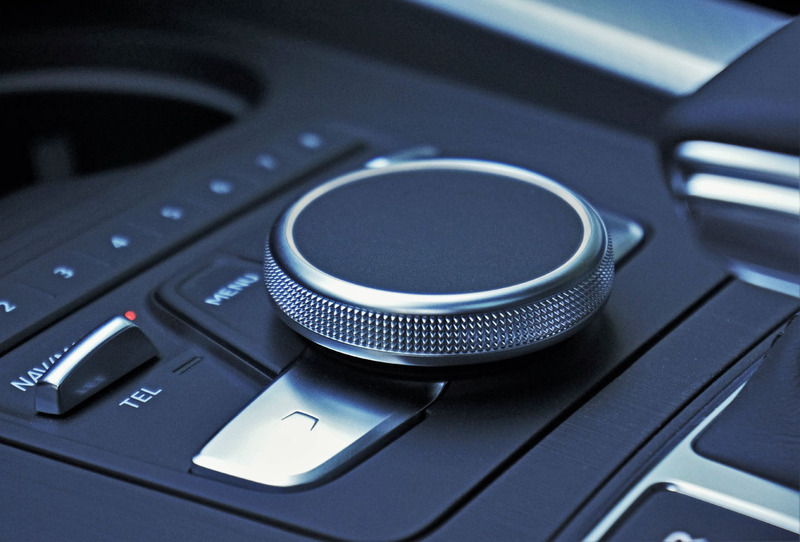 as a regular automatic yet even quicker shifting for a thoroughly engaging experience, especially when popped into its “S” manual position. 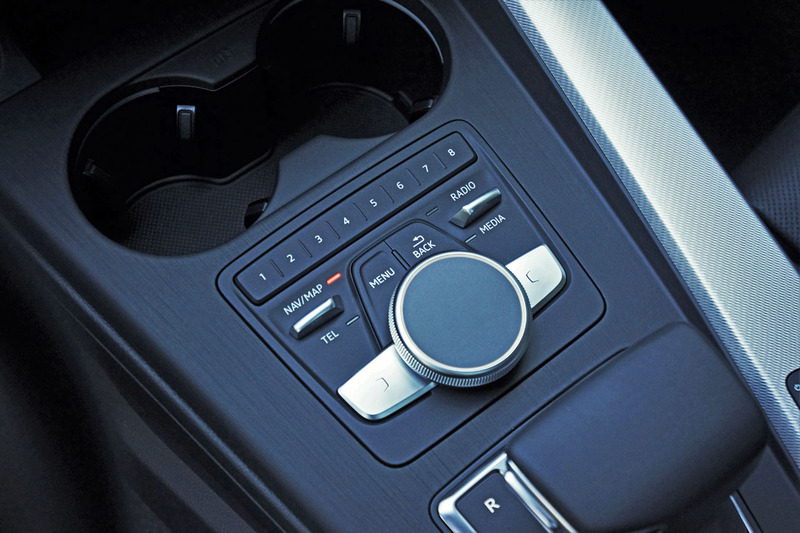 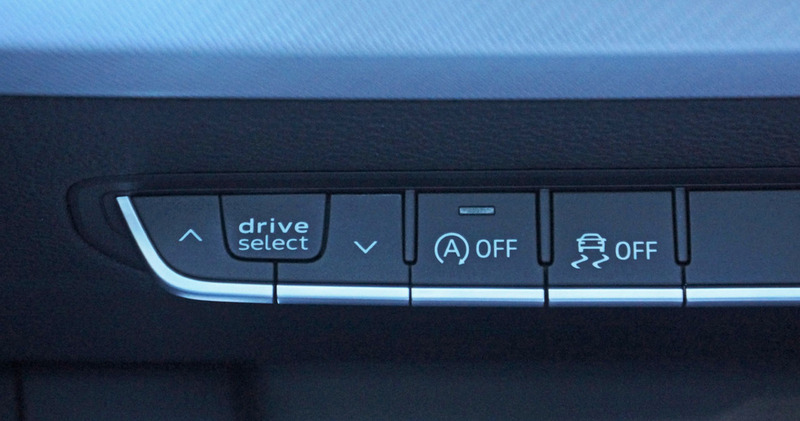 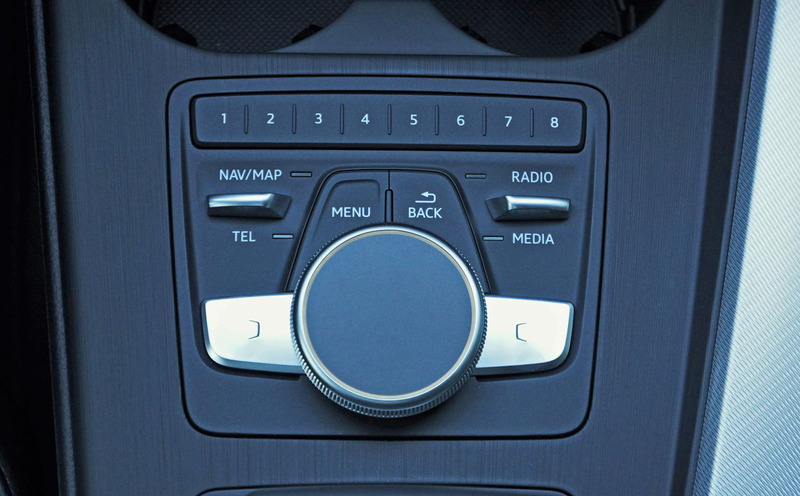 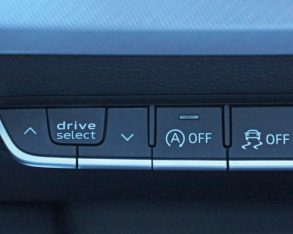 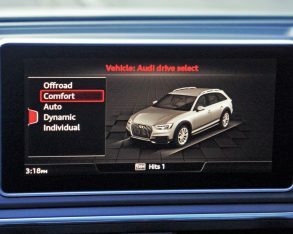 You’ll want to set Drive Select to Dynamic mode too, and then let your fingertips take control via steering wheel paddles that make the most of the A4 Allroad’s sole engine choice. 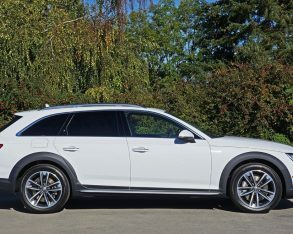 Allroad’s slight gain in ride height and greater rear mass means that it’s not quite as taut around tight corners as the A4 sedan, but this is a reasonable compromise when factoring in its greater capability in deep snow and, if you dare, off-road (remember to slip it into Offroad mode). 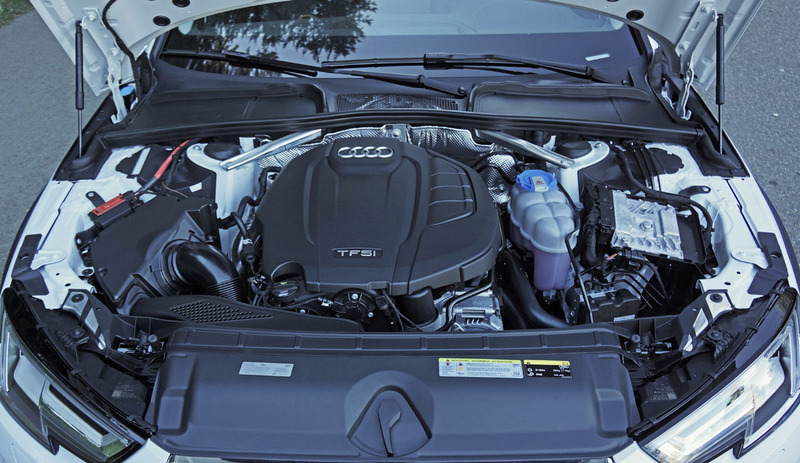 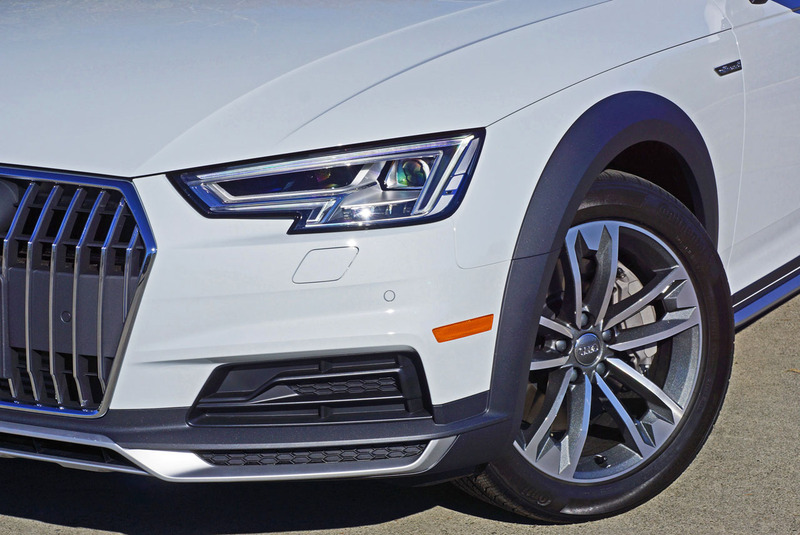 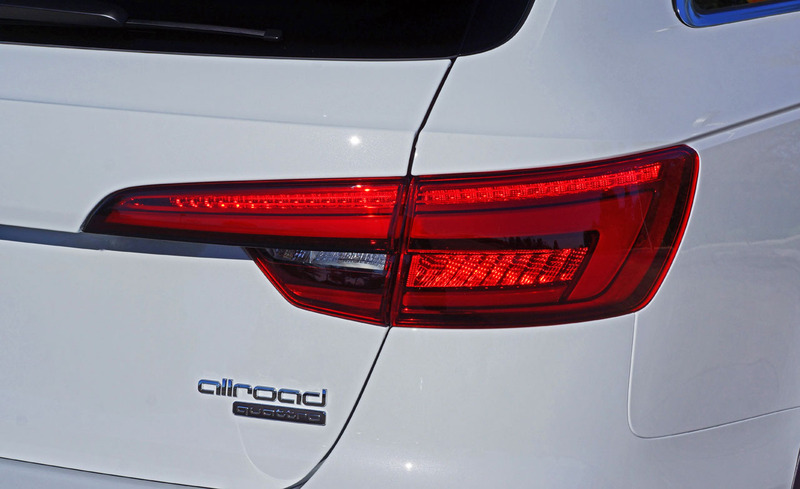 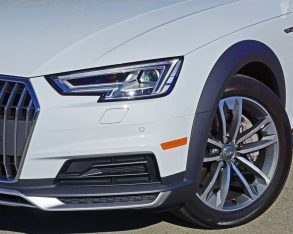 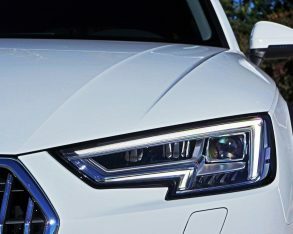 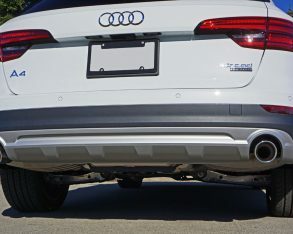 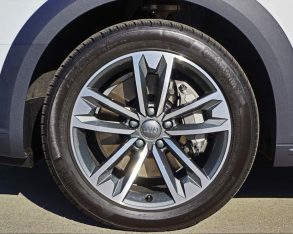 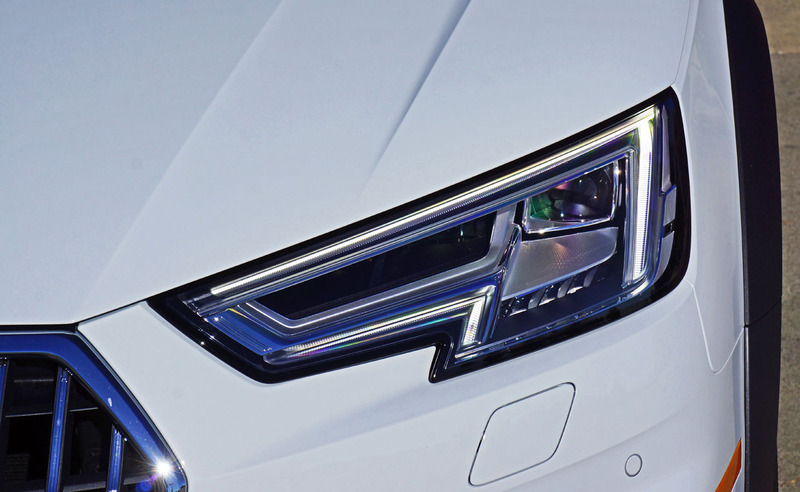 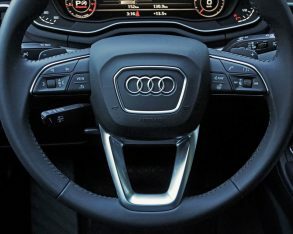 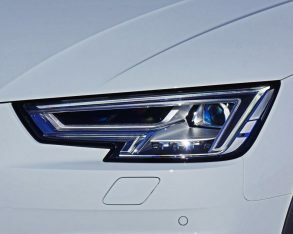 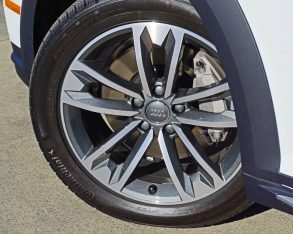 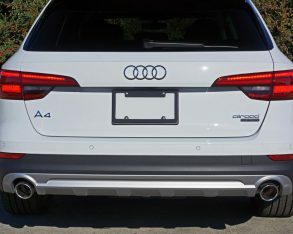 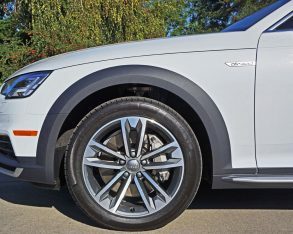 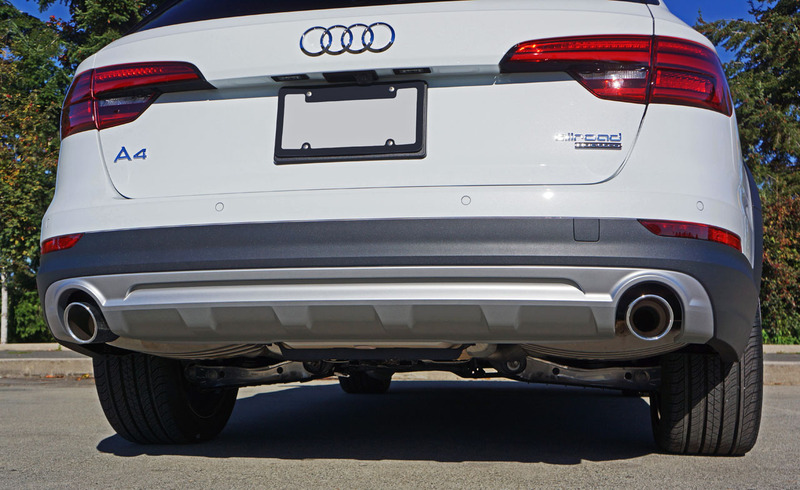 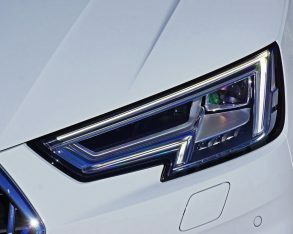 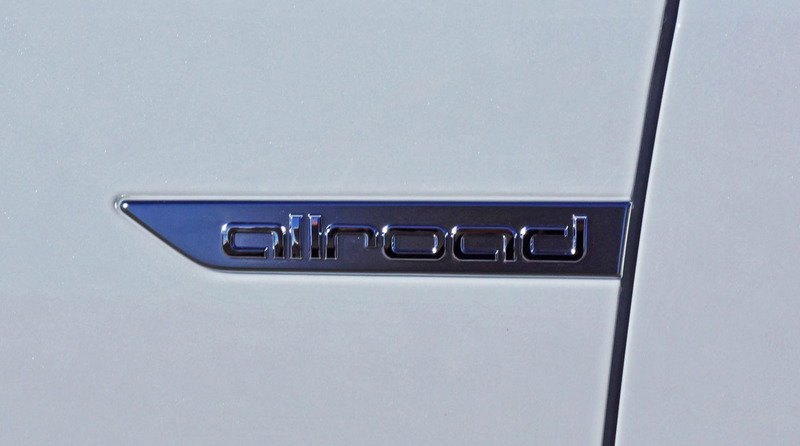 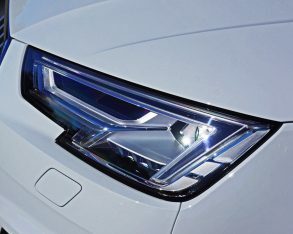 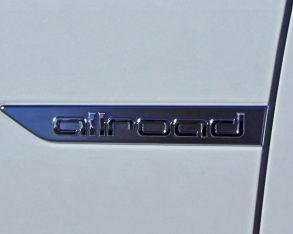 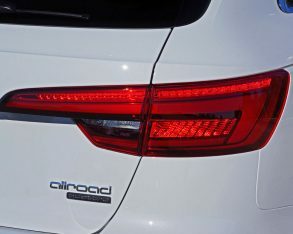 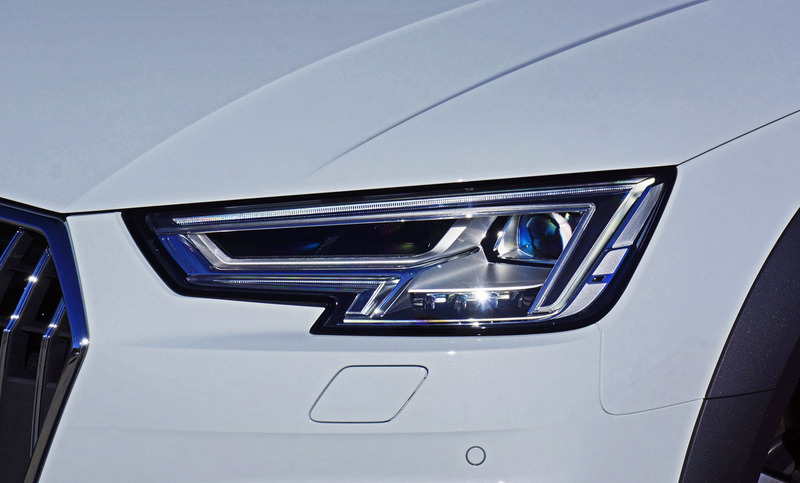 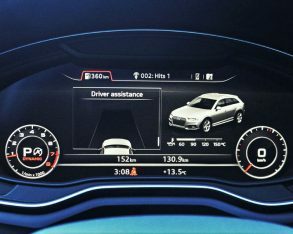 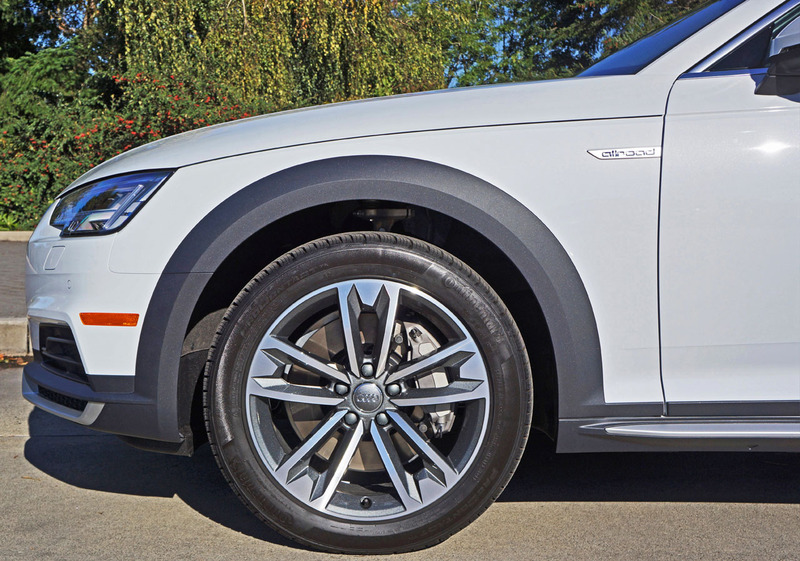 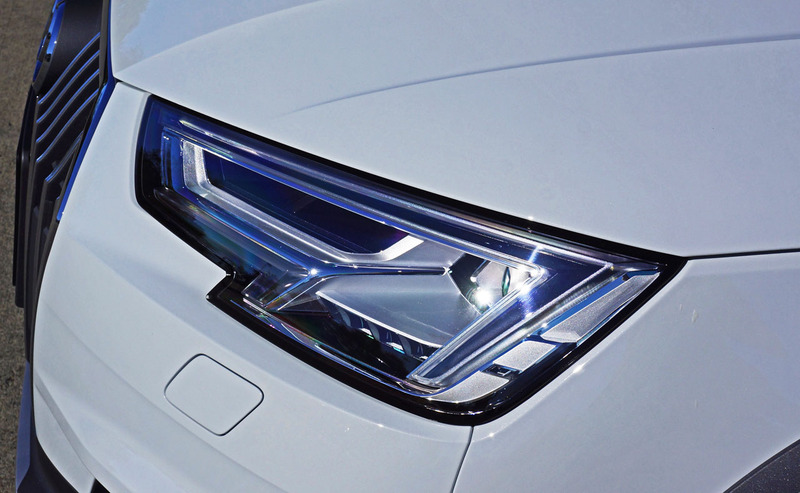 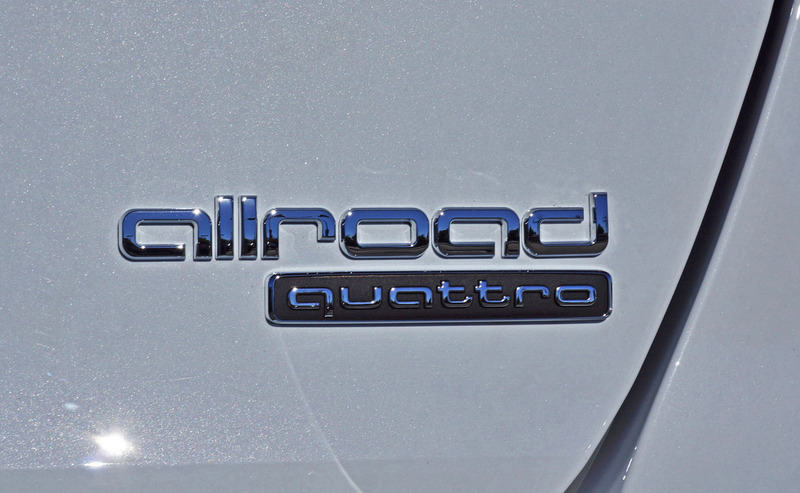 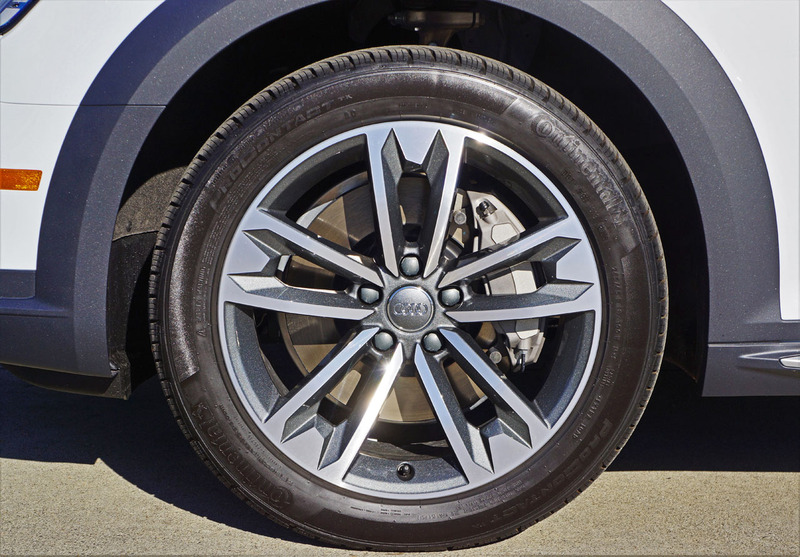 Of note, the new A4 Allroad is the first Audi to benefit from a new all-wheel drive design dubbed Quattro Ultra, which can disconnect its rear axle when not required in order to save fuel. 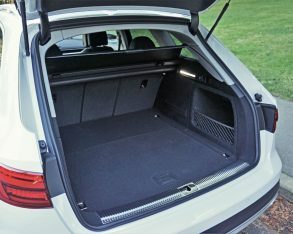 at just 750 kilos (1,650 lbs) here it’s probably best to use this as your guide, or discuss further with your dealer. 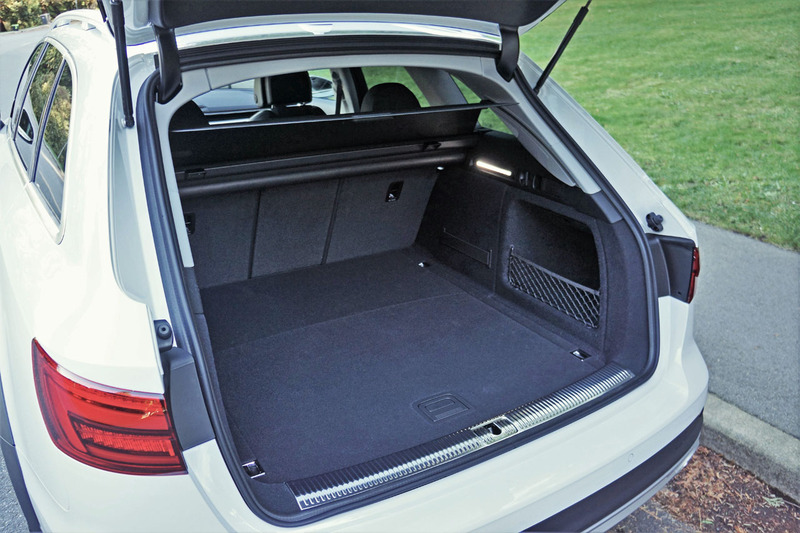 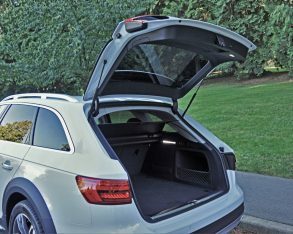 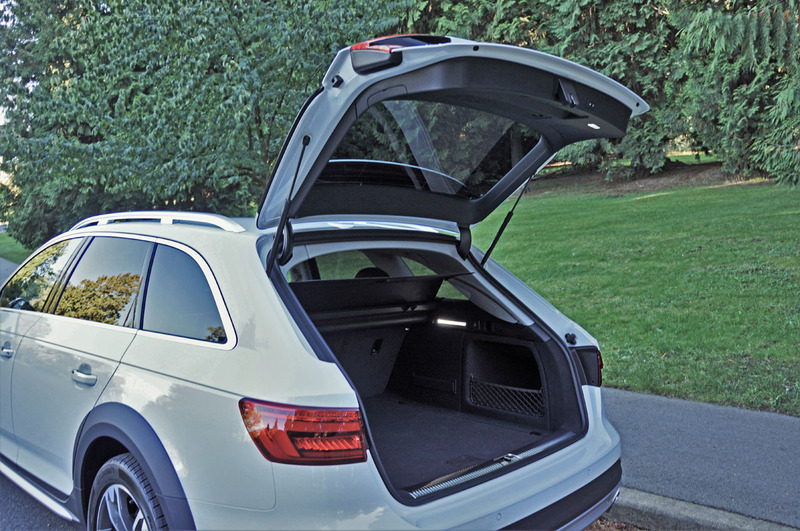 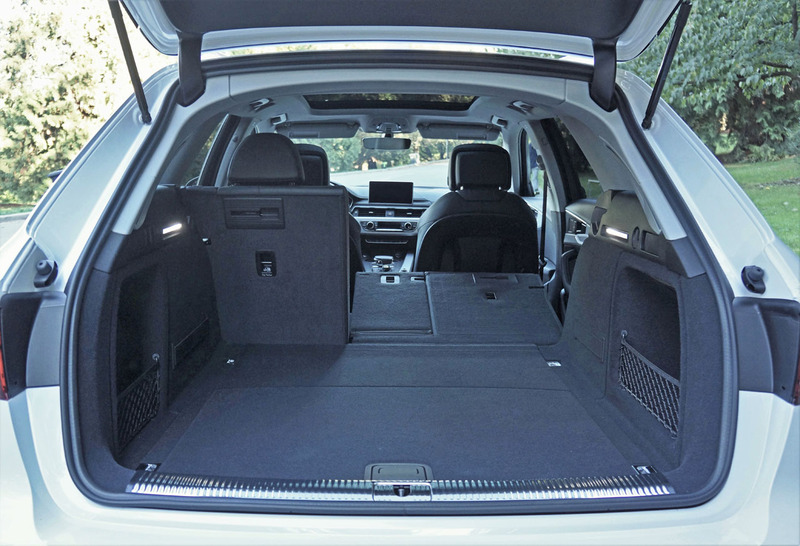 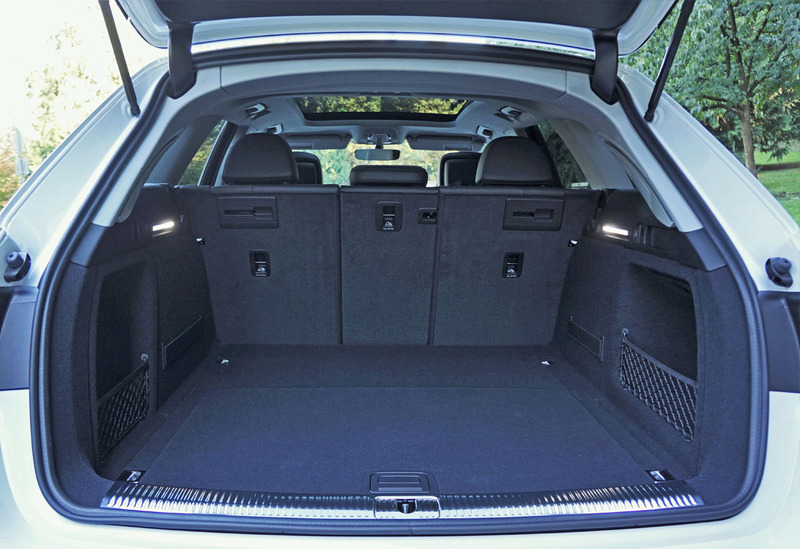 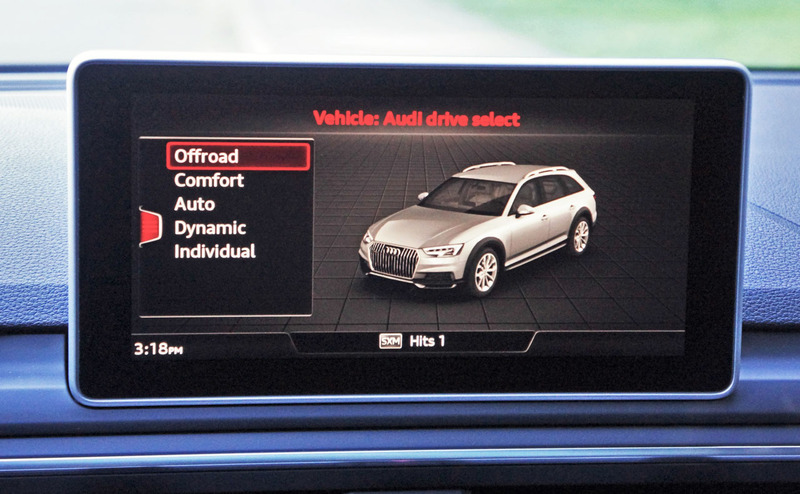 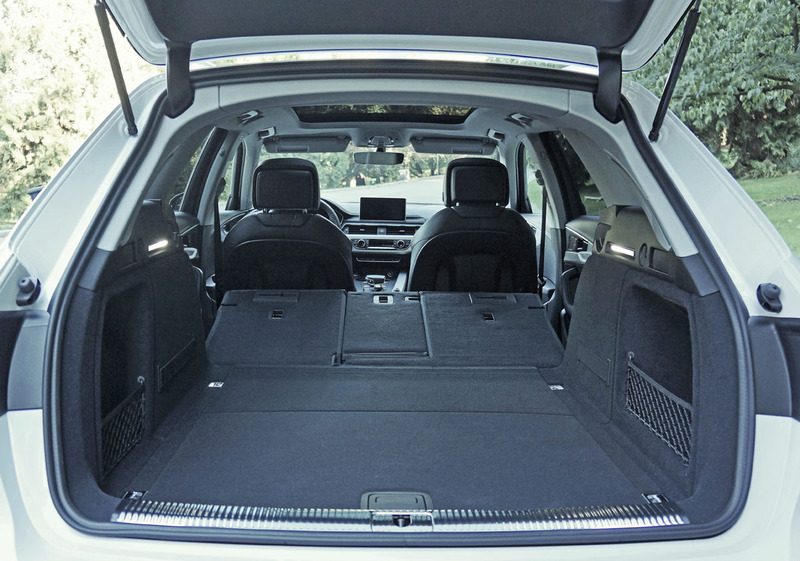 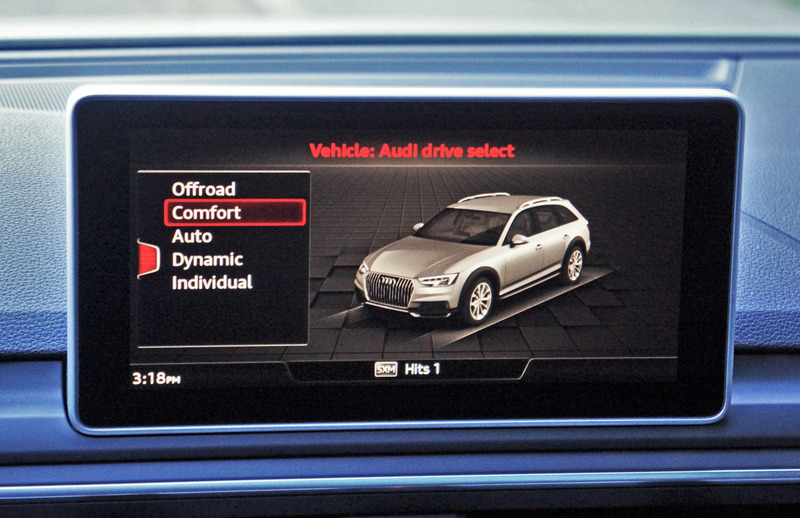 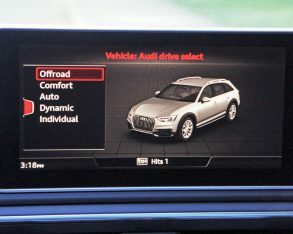 For those who’d like to haul a trailer but never mustered the courage, the Allroad can be had with an MMI infotainment-sourced feature that automatically adjusts the front wheels to the appropriate angle when reversing with a trailer. 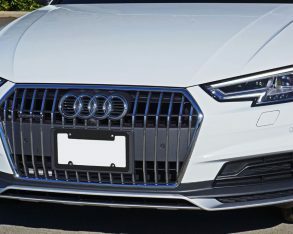 again, it didn’t score quite as highly in J.D. 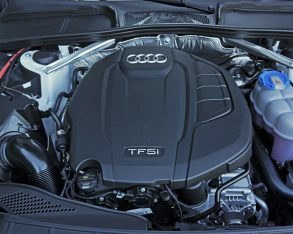 Power’s most recent 2016 Vehicle Dependability Study at just sixth out of 12 premium brands, albeit besting Mercedes-Benz, Infiniti, BMW, Cadillac, and Volvo that all nevertheless finished above average when mixing in mainstream volume brands (it beat Land Rover too, but the British brand was way below average). 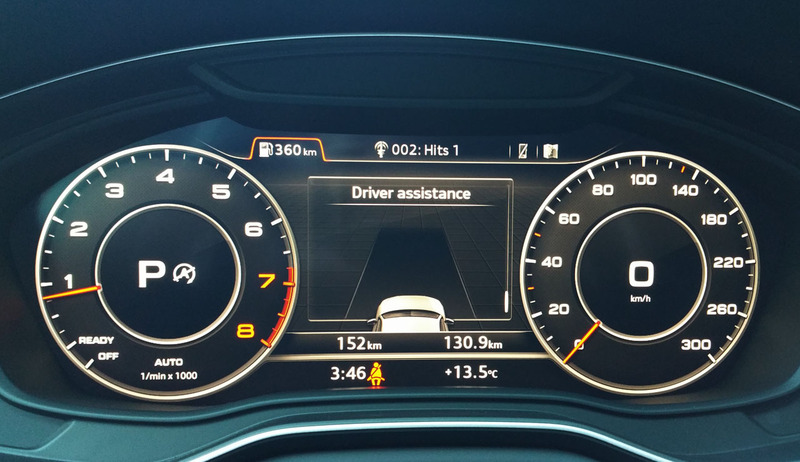 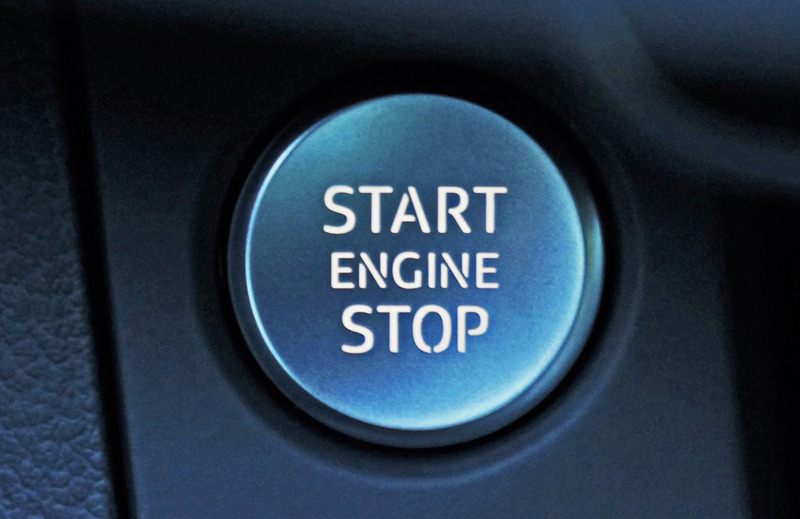 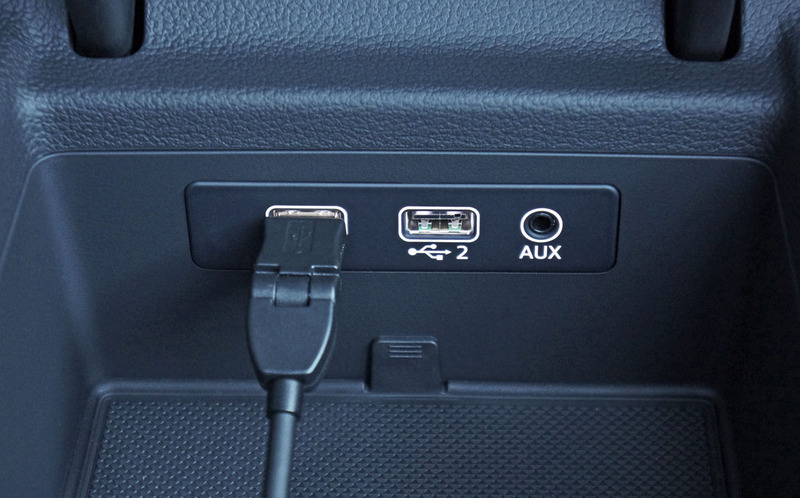 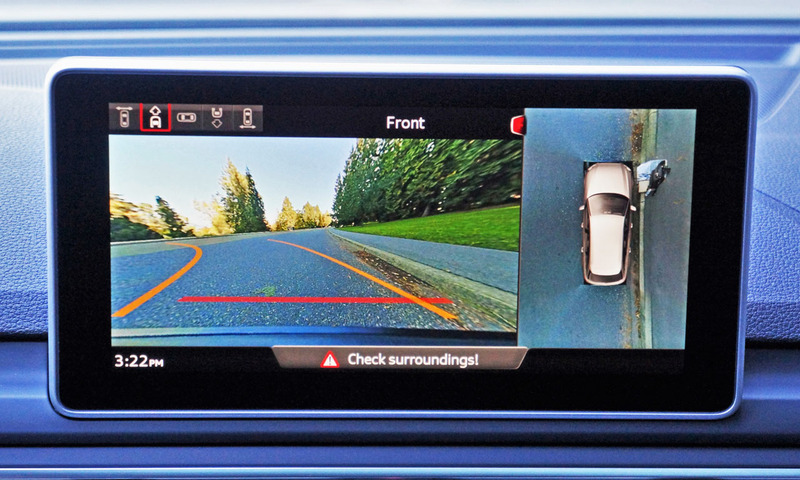 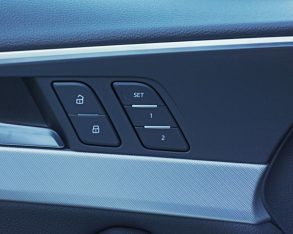 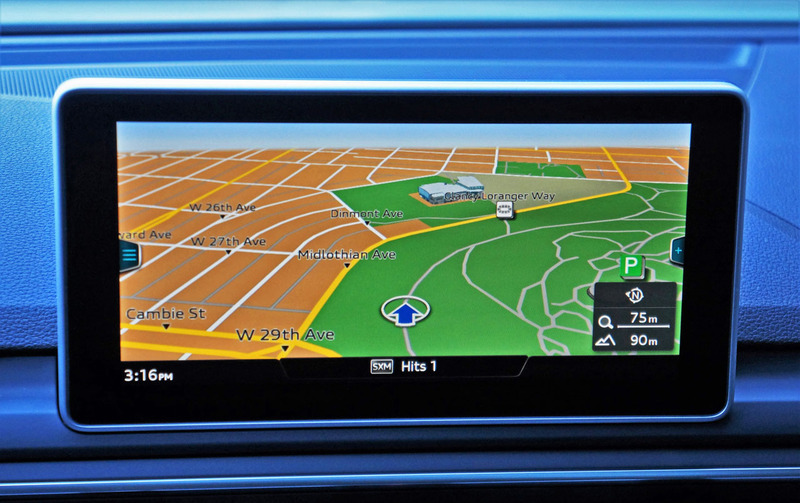 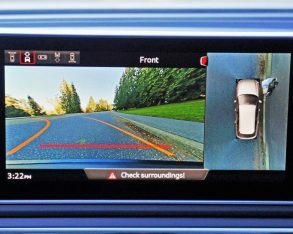 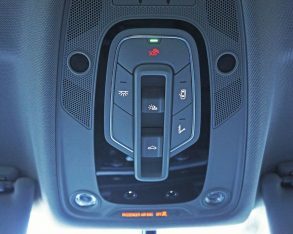 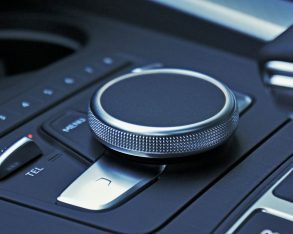 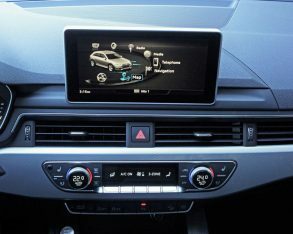 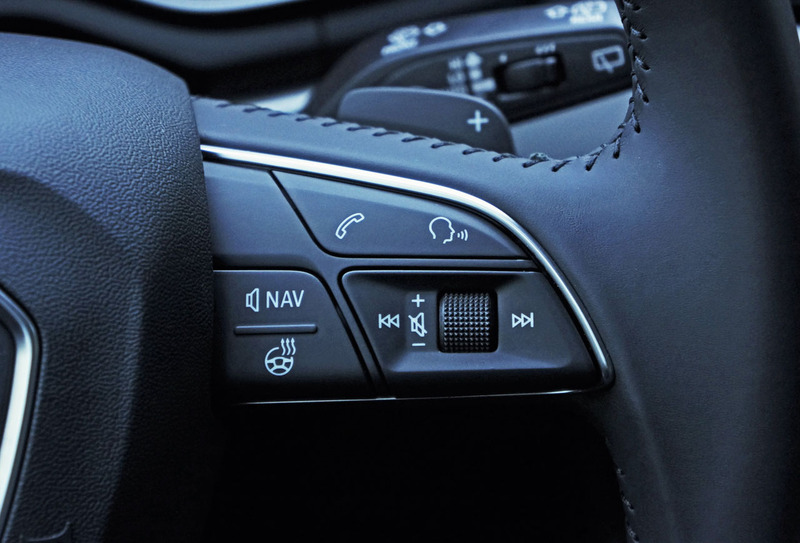 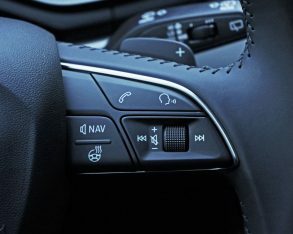 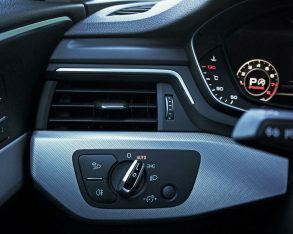 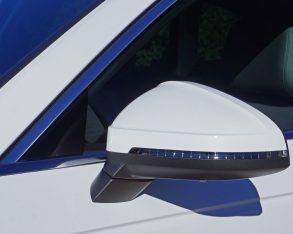 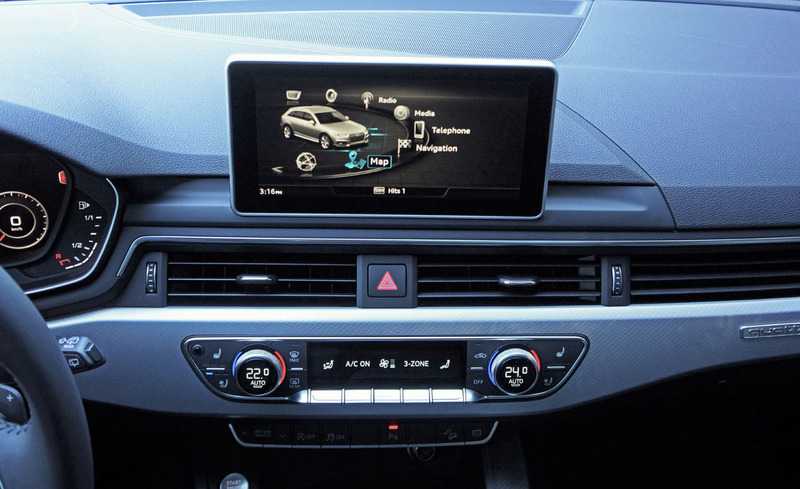 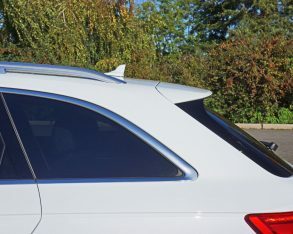 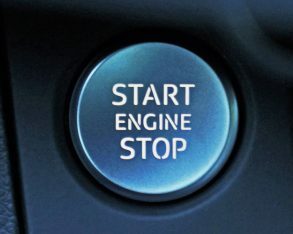 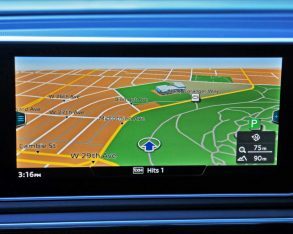 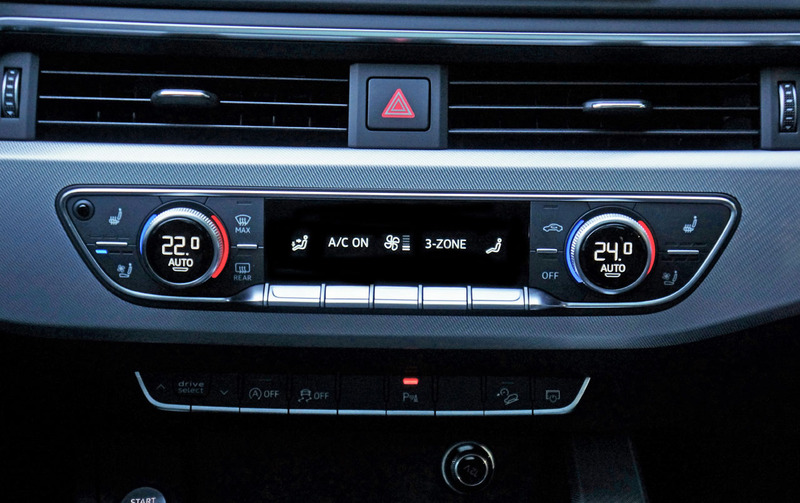 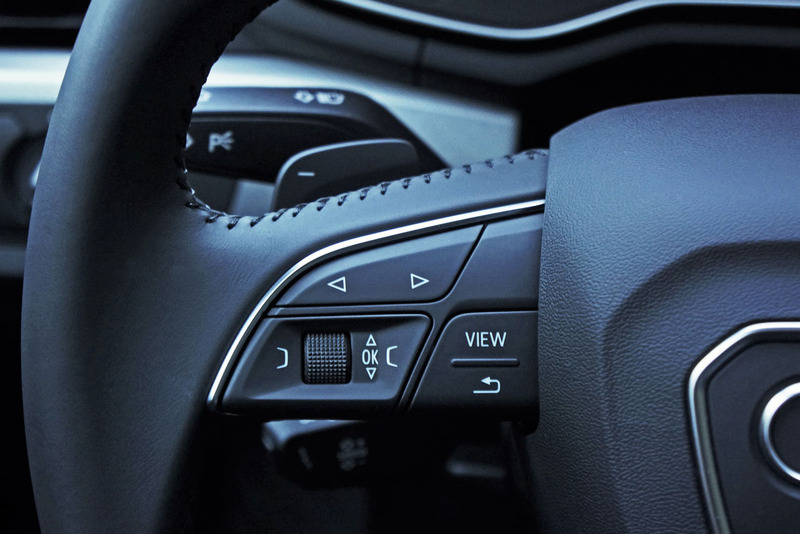 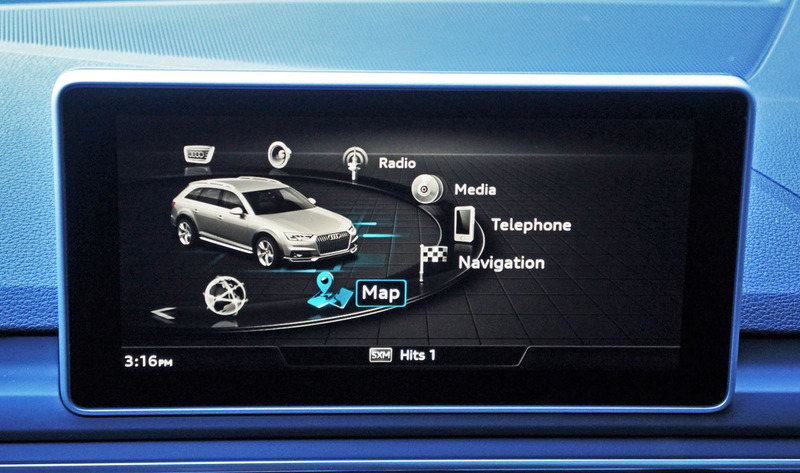 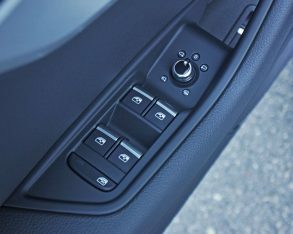 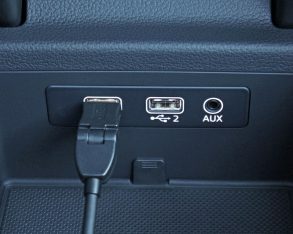 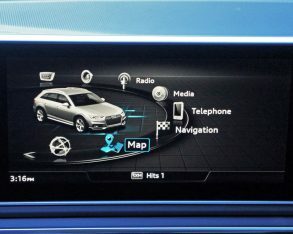 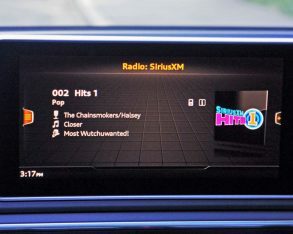 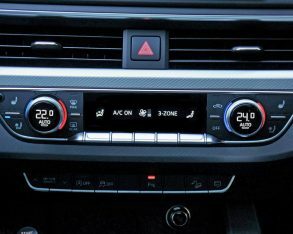 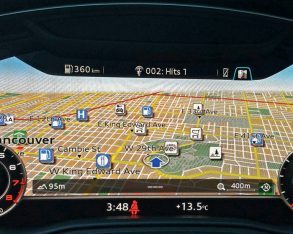 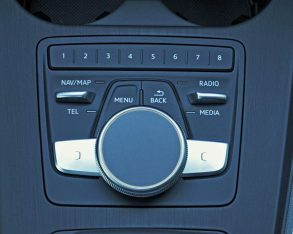 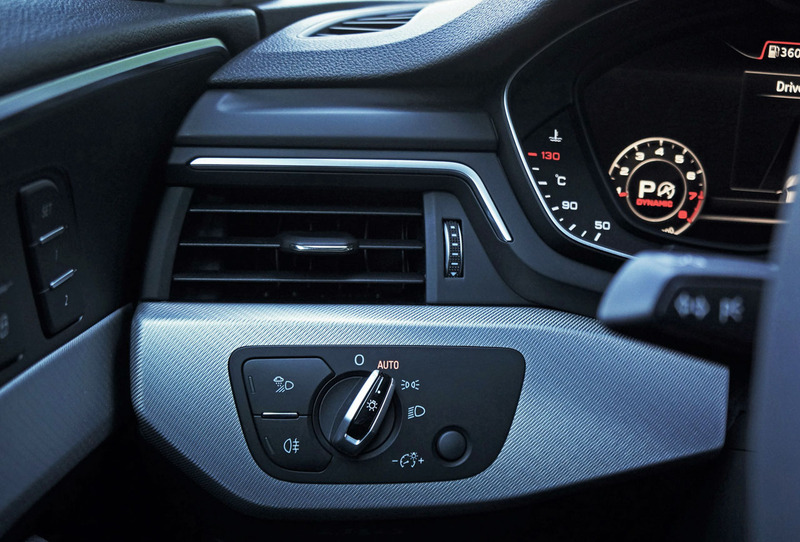 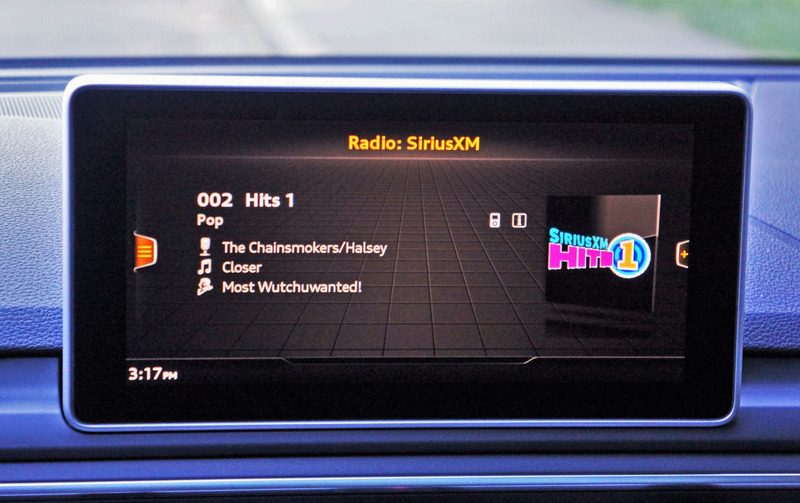 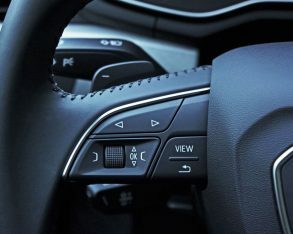 arrives, which will separate infotainment system complaints from actual reliability issues, so don’t think that a below average score in the third party analytical firm’s studies means that you’ll be cursing your new ride at the side of the road, as you may just be flummoxed by its navigation system. 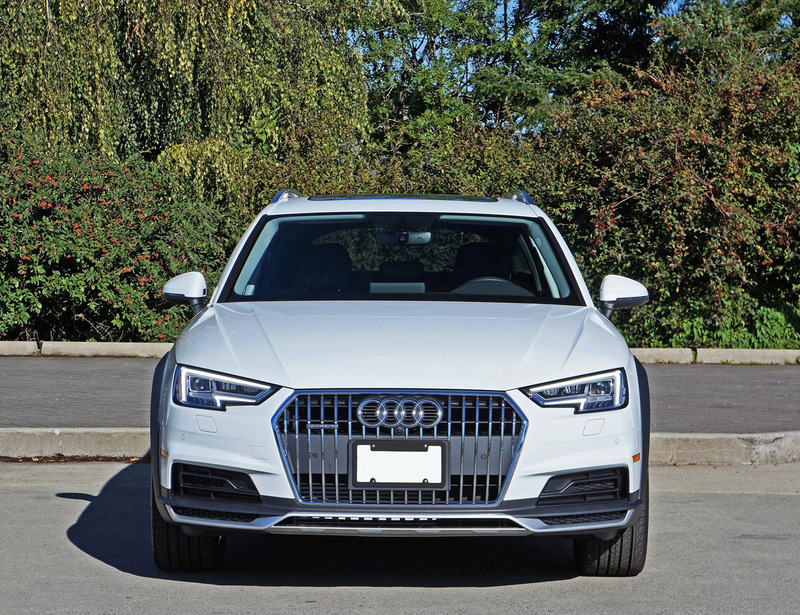 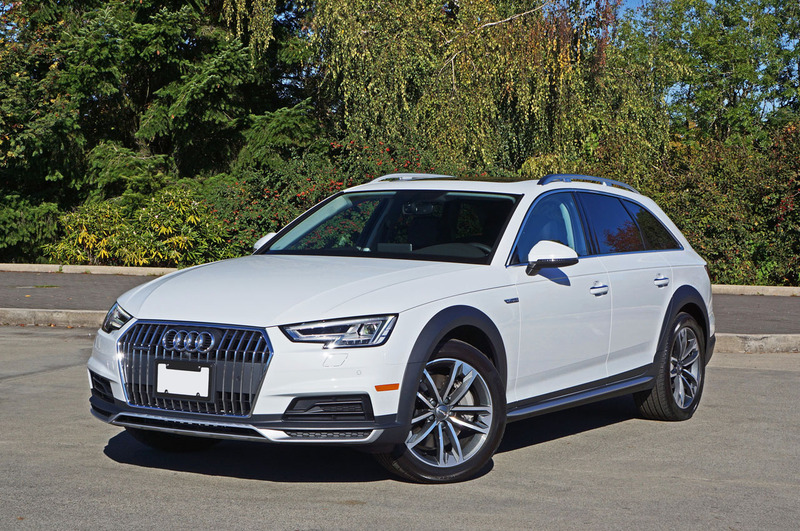 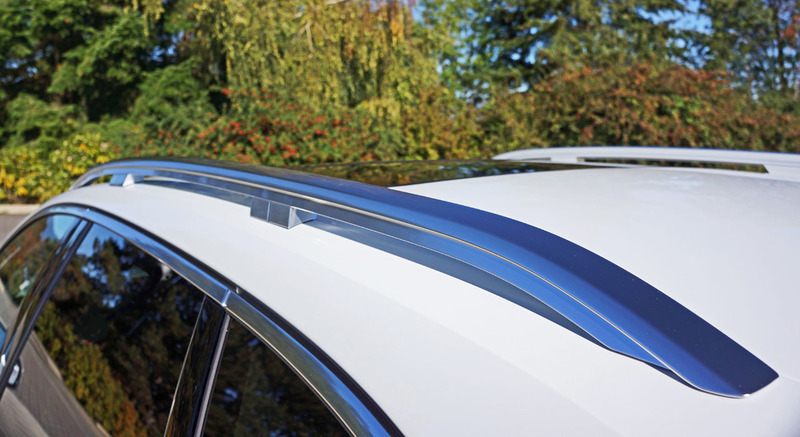 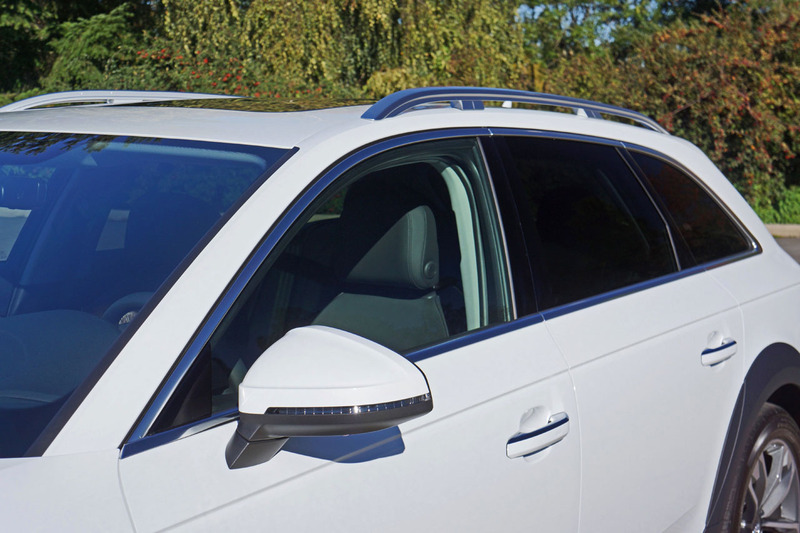 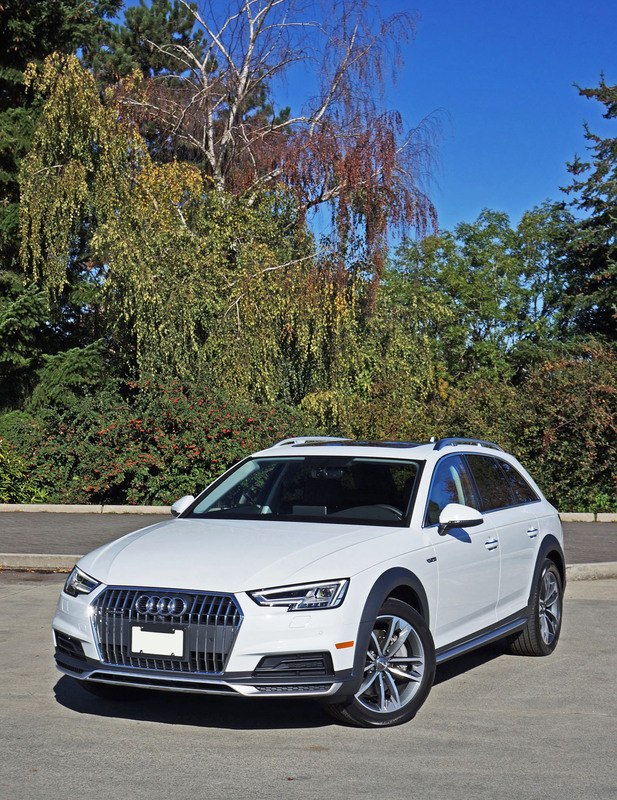 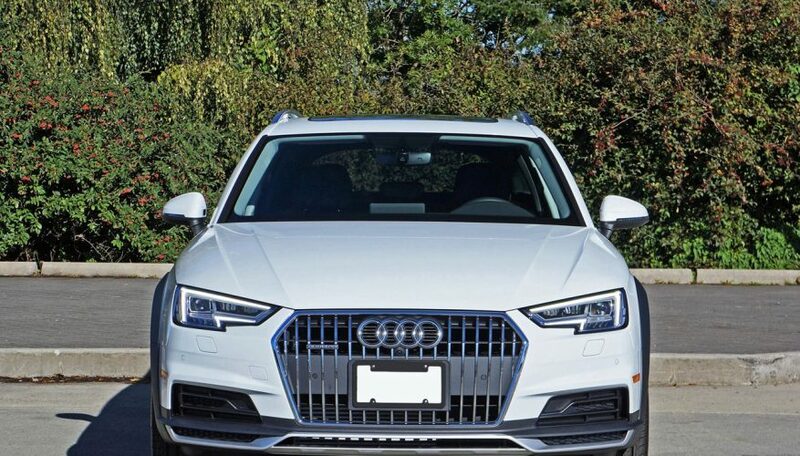 I certainly had difficulty finding fault with the new Allroad, its superb balance of performance and comfort, style and luxury, high tech and warm ambience winning over my leanings toward elegant contemporary living. 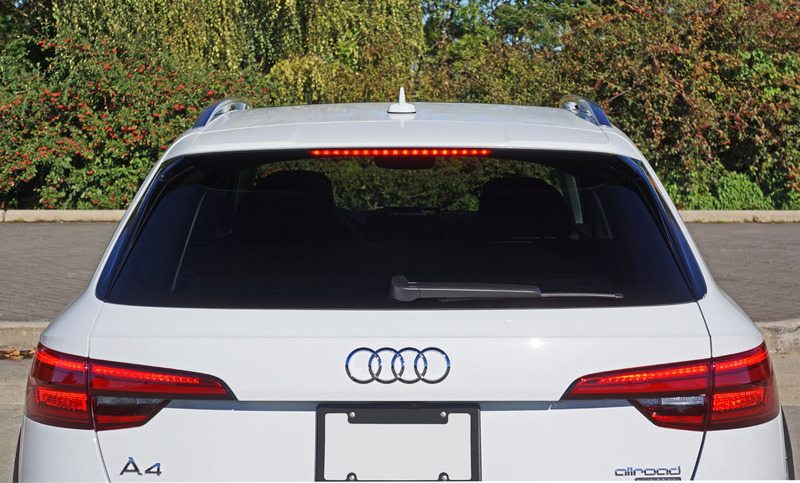 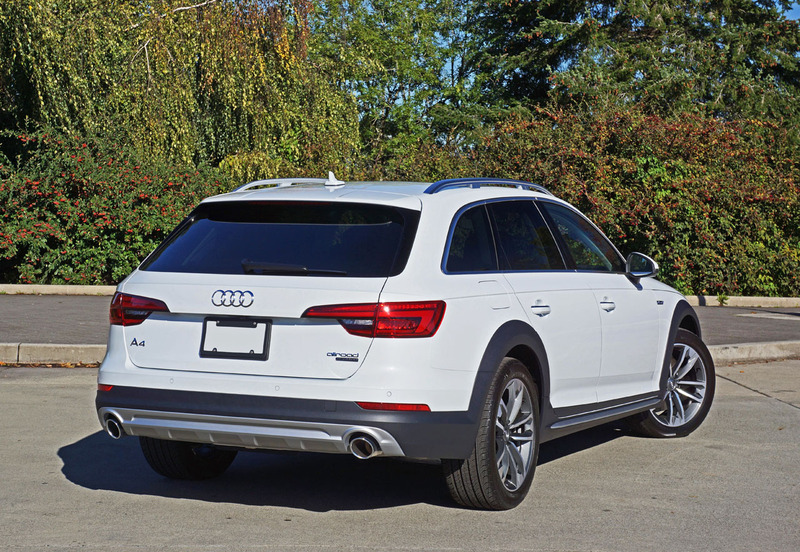 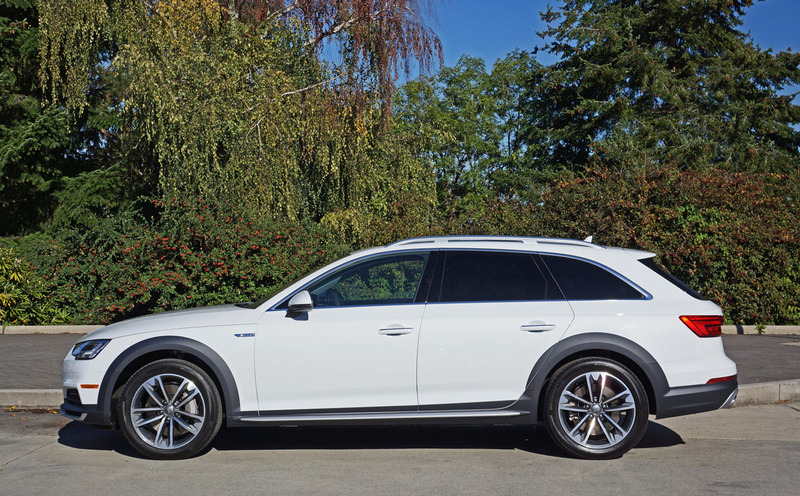 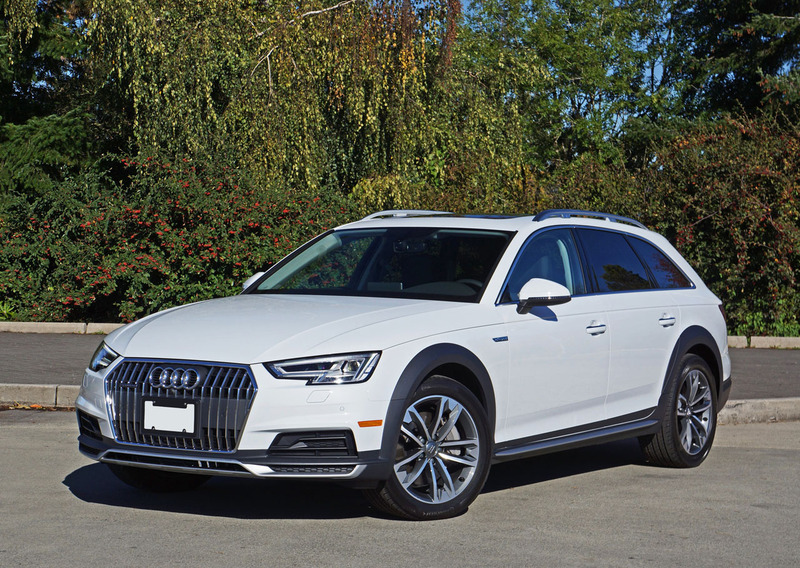 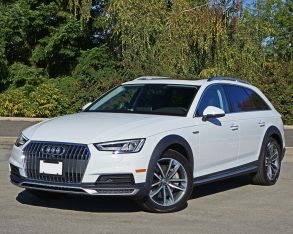 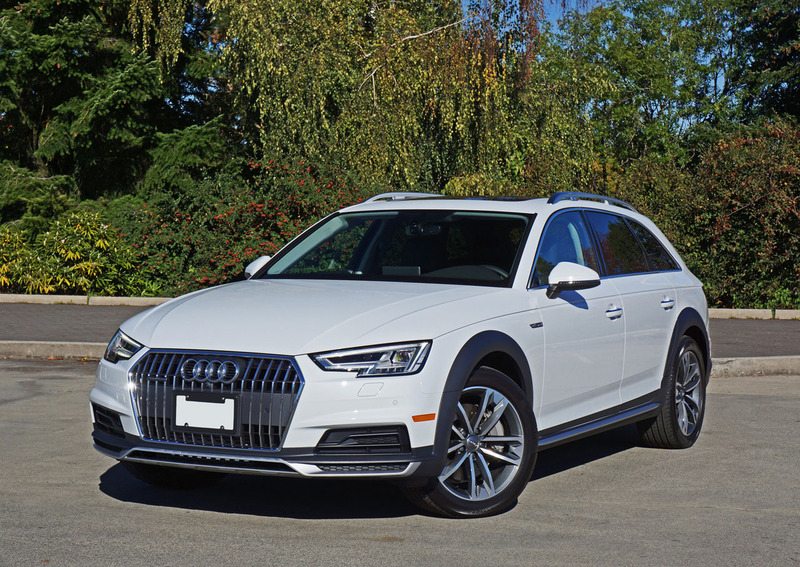 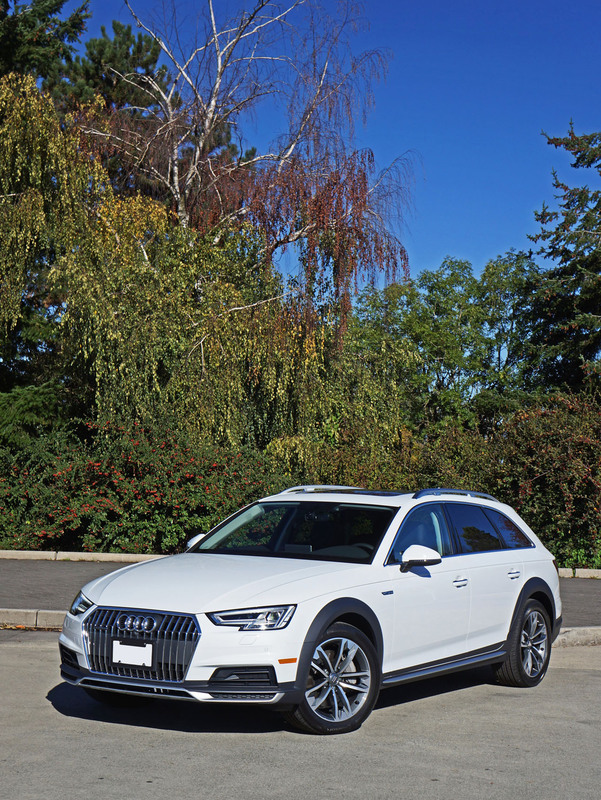 This 2017 edition thoroughly modernizes the Allroad’s winning formula, and will no doubt retain its most desirable compact sport wagon crossover title. 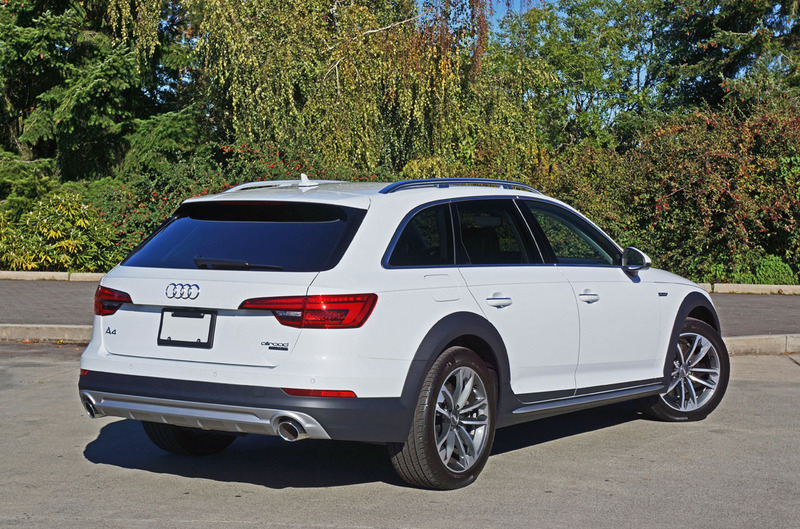 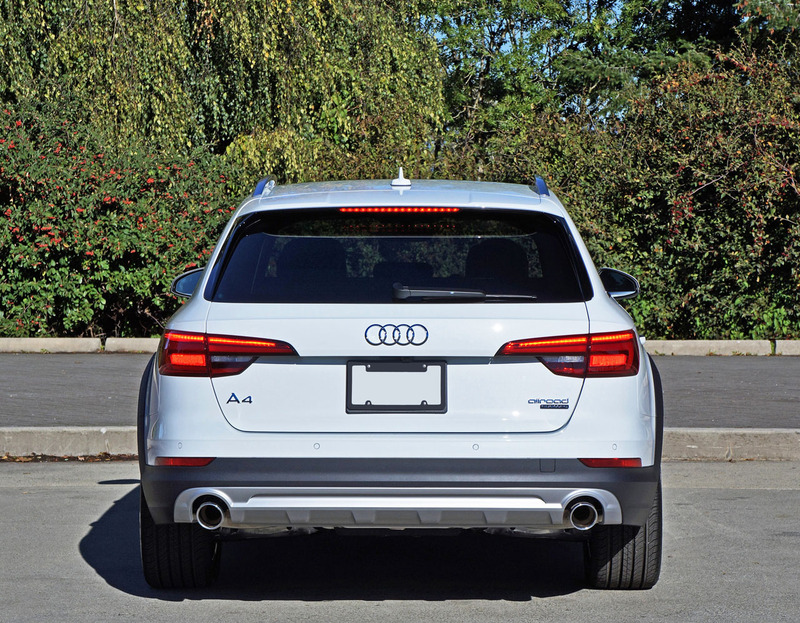 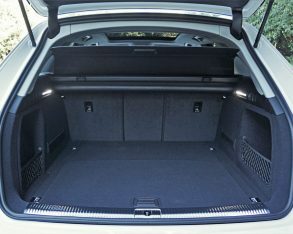 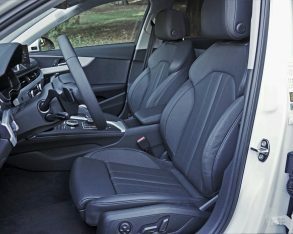 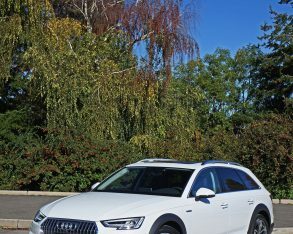 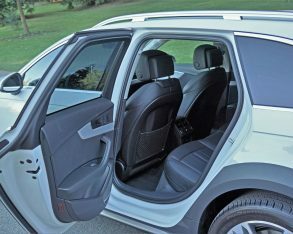 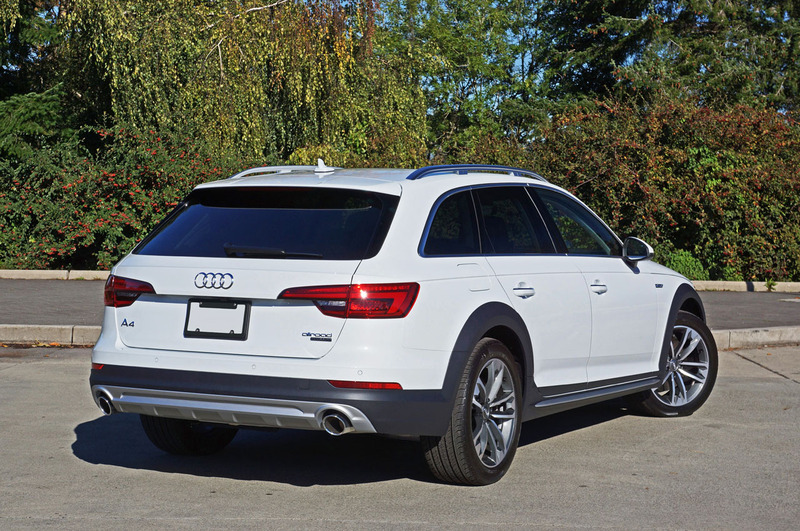 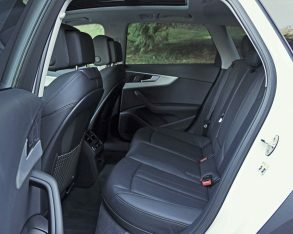 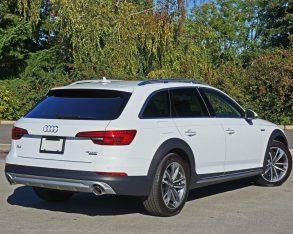 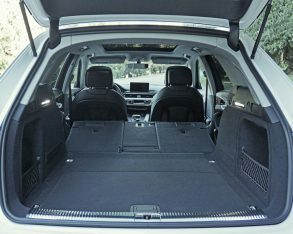 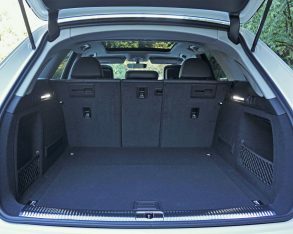 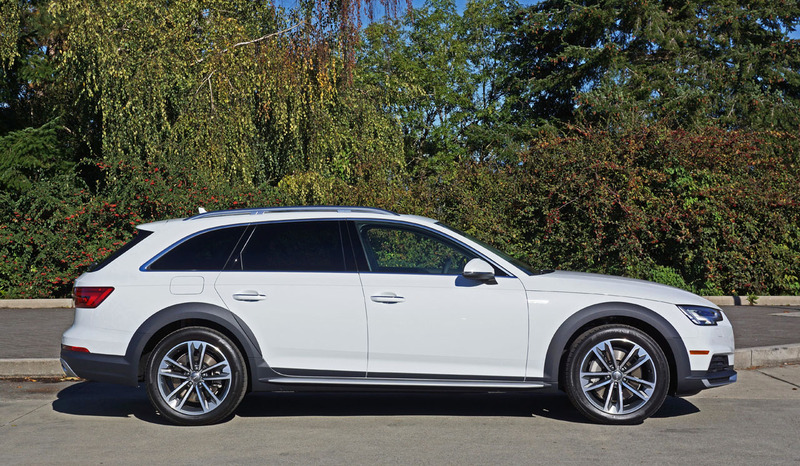 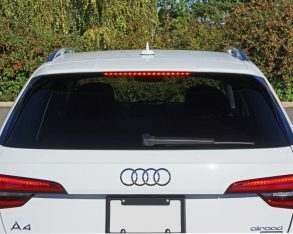 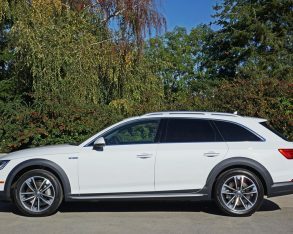 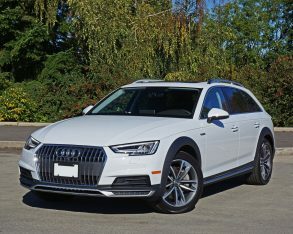 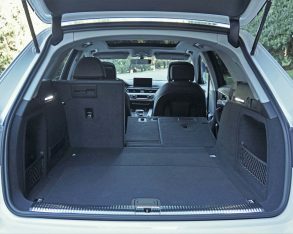 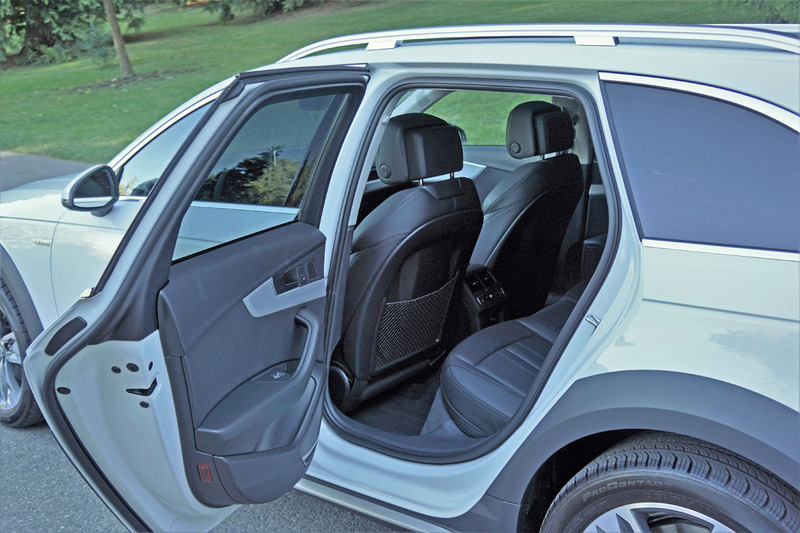 there are many more SUV buyers than wagon buyers these days, even when said wagon is done out with arguably more attractive crossover styling and similarly capable light-duty trail credentials, but even if you’re leaning toward a more SUV-like crossover you should take the A4 Allroad for a ride. 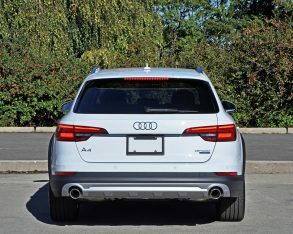 I’m willing to guess you’ll be more than happy with its 34-mm (1.3-inch) taller CUV-like ride height and will no doubt appreciate its more car-like handling, while it certainly doesn’t give up much in practicality over its slightly loftier compact SUV siblings. 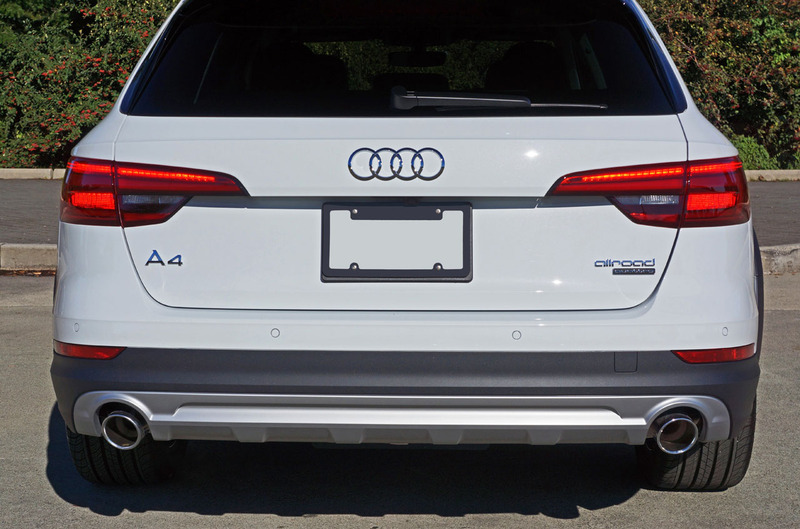 The A4 Allroad also sets you apart from the crowd as a more enviro-conscious adventurer. 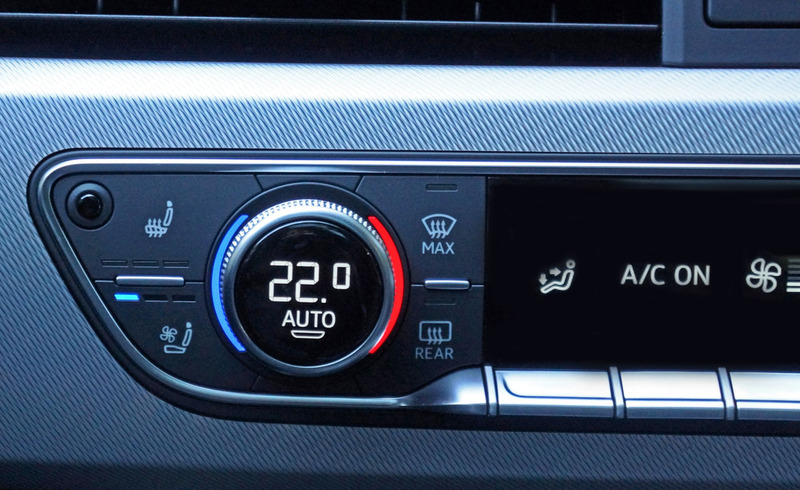 I don’t know about you, but I like the sound of that.